Life-prolonging Ōwakudani 大涌谷 black eggs, here I come! 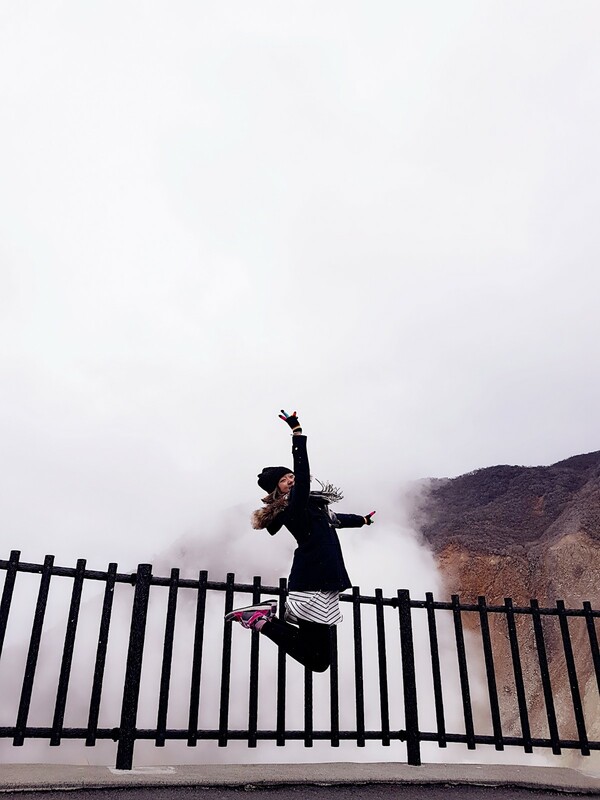 Waking up at 5.30 in the morning was not easy, but it was totally worth it if it’s for travel (and food, of course). 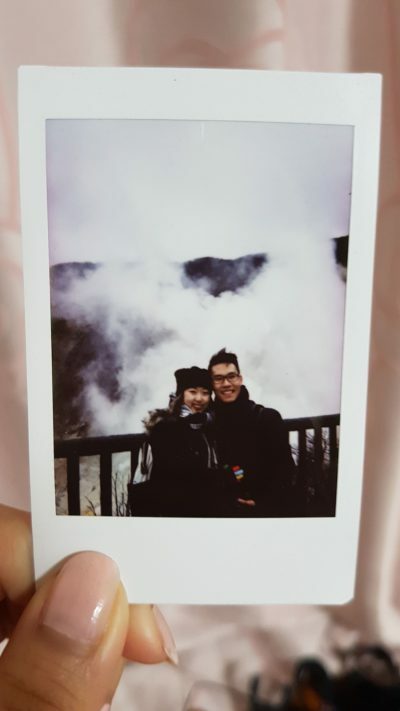 That day, we were up before the sun had risen. Being in Japan had the luxury of grabbing breakfast at your nearest convenience store anytime, even before dawn for a very cheap price. We were lucky to have a 7-11 and a Family Mart within 5 minutes from our Airbnb, so I grabbed these for brekkie from 7-11 that day. 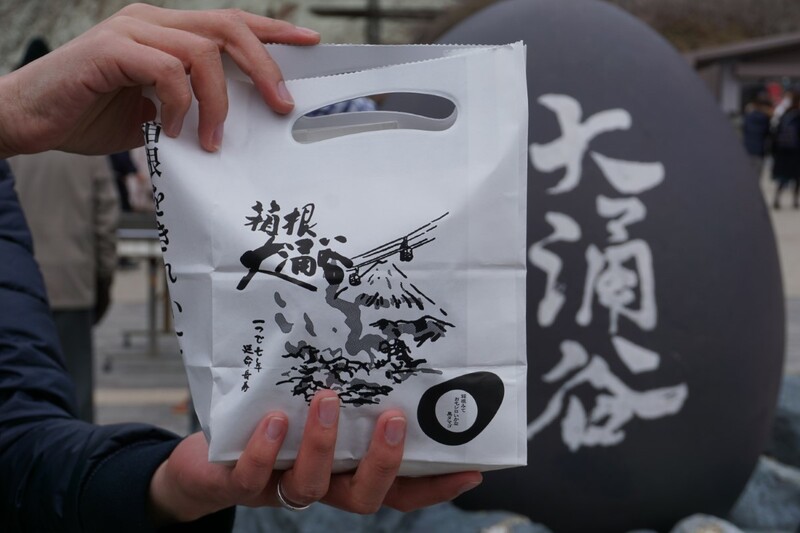 A huge range of onigiri (Japanese rice balls) was available for as cheap as 100 yen each! 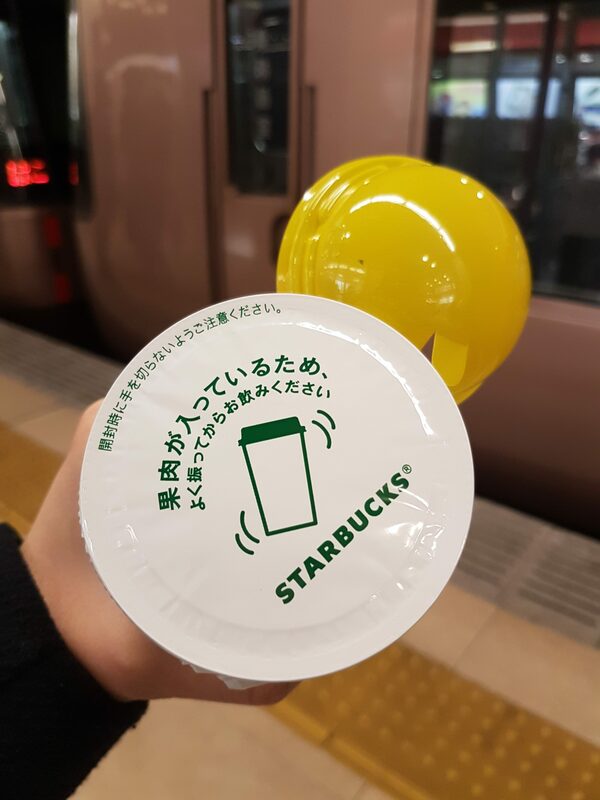  I also grabbed a Starbucks Banana Creamy Milk, which was one of the most delicious milk drinks I have tried. Even the Starbucks cup itself was cute! 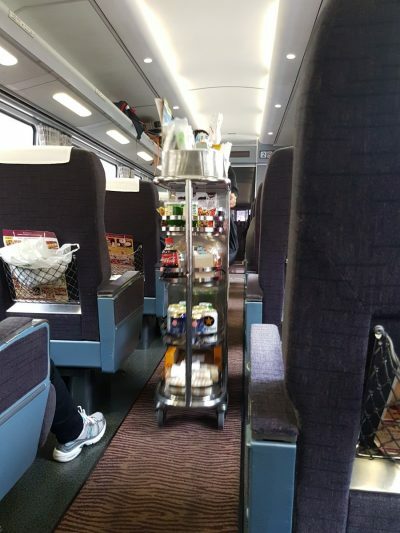 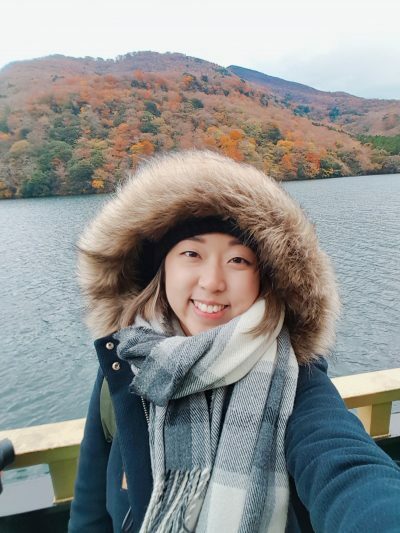 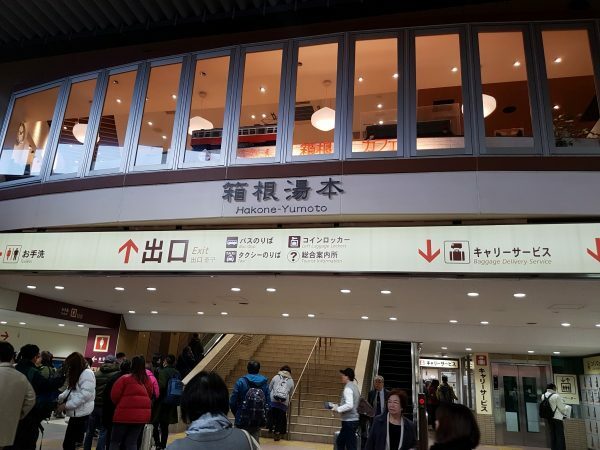 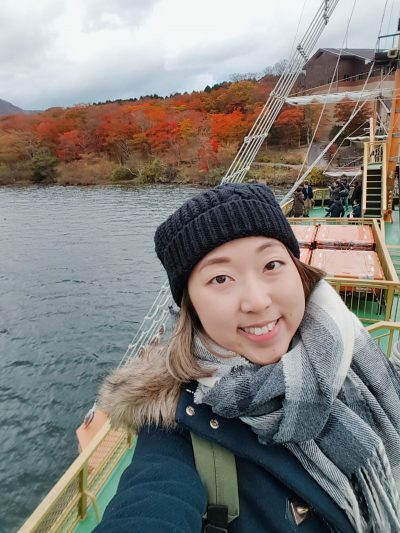 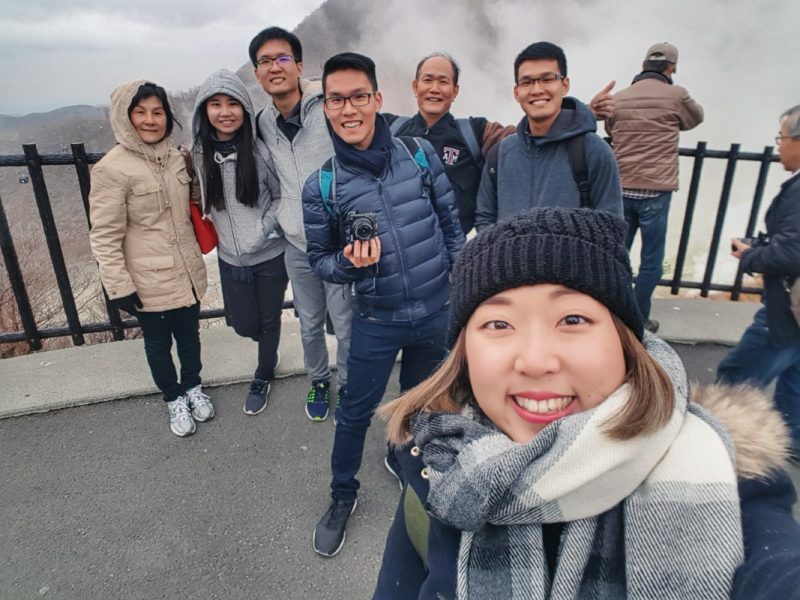 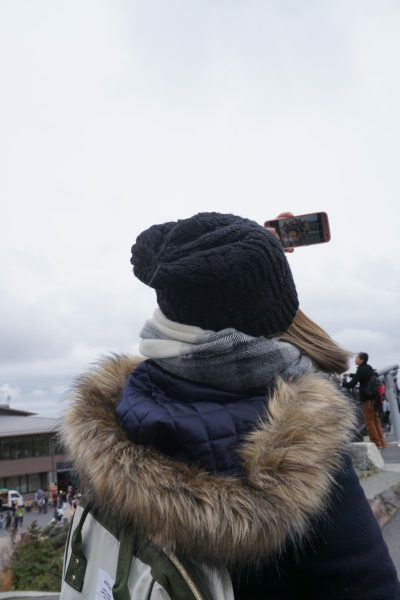 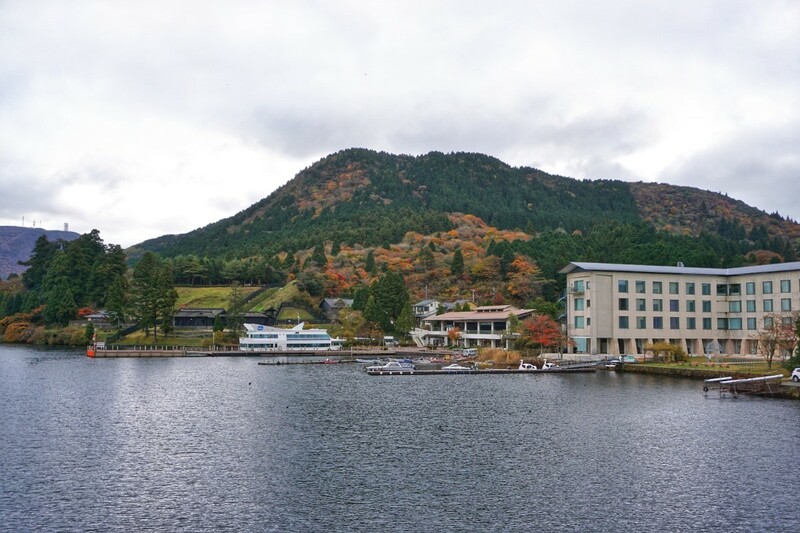 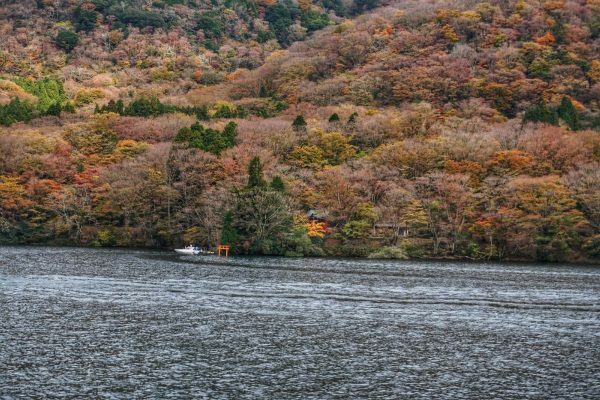 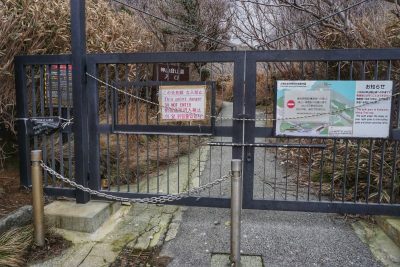 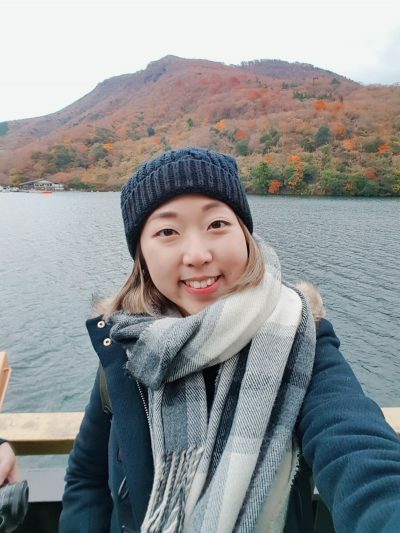 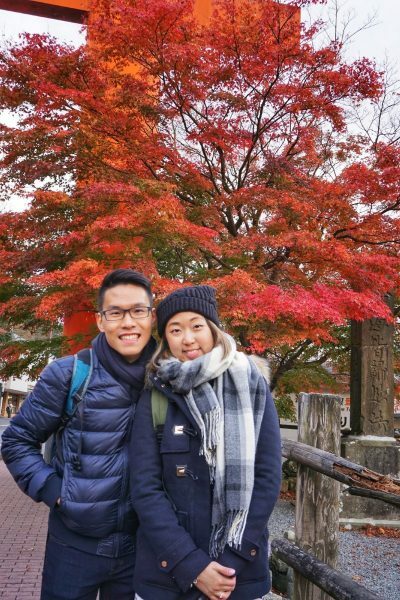 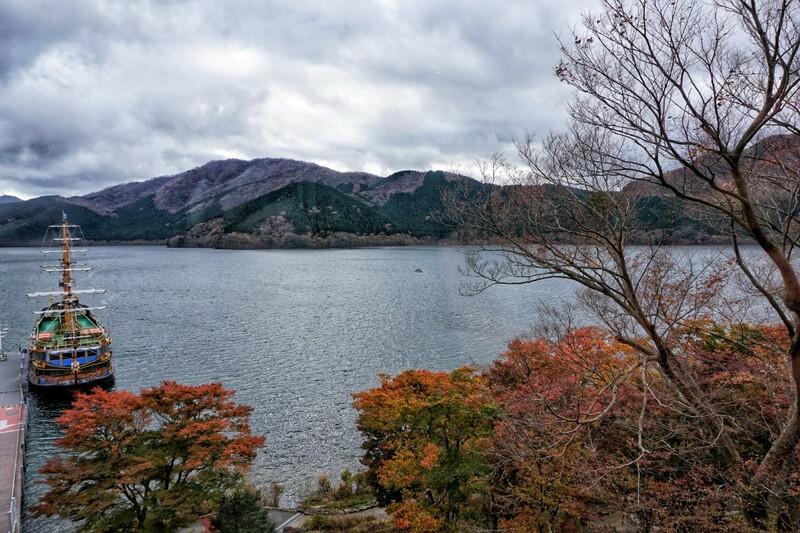 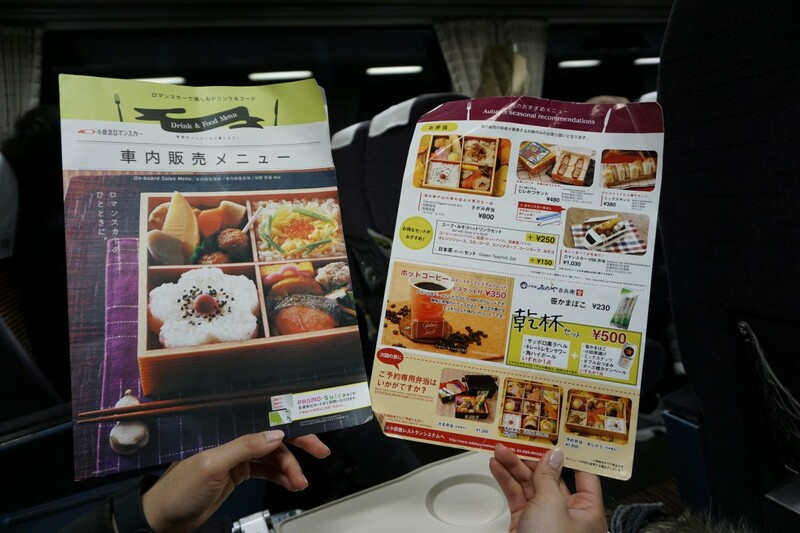 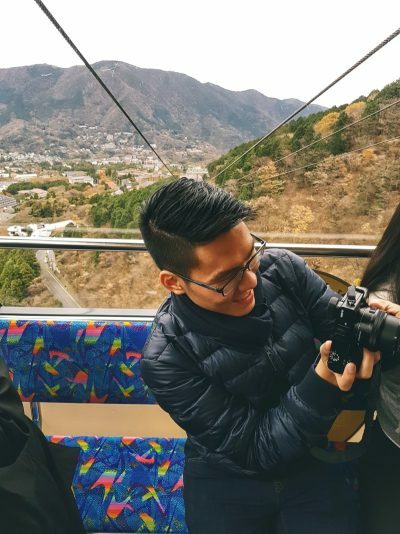 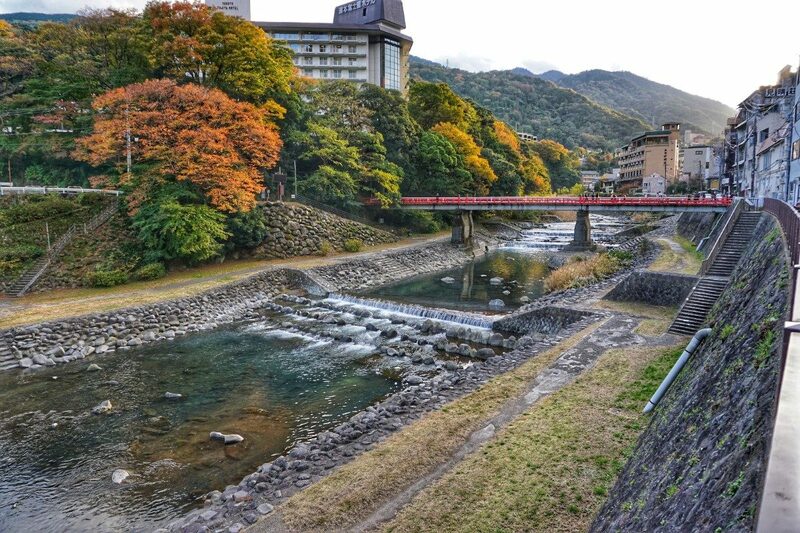 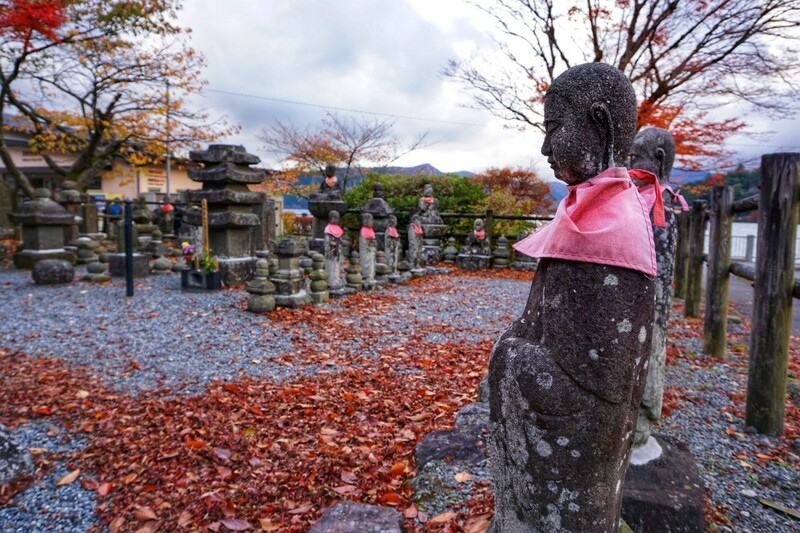 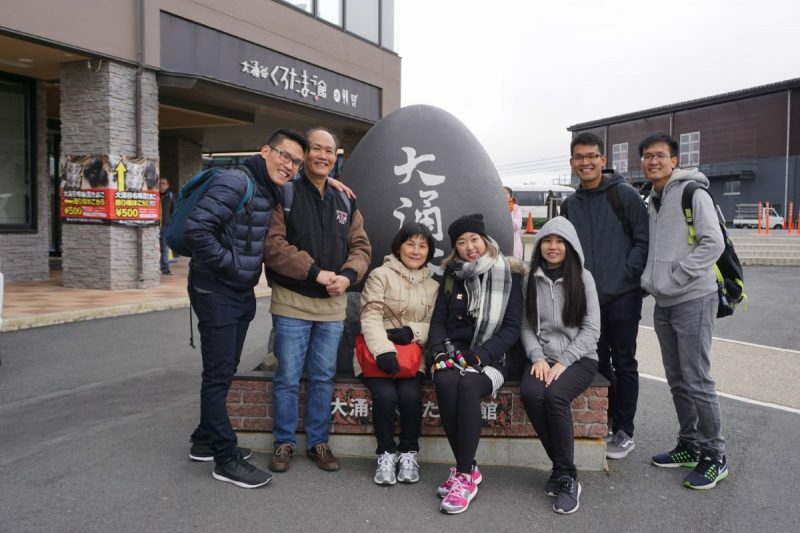 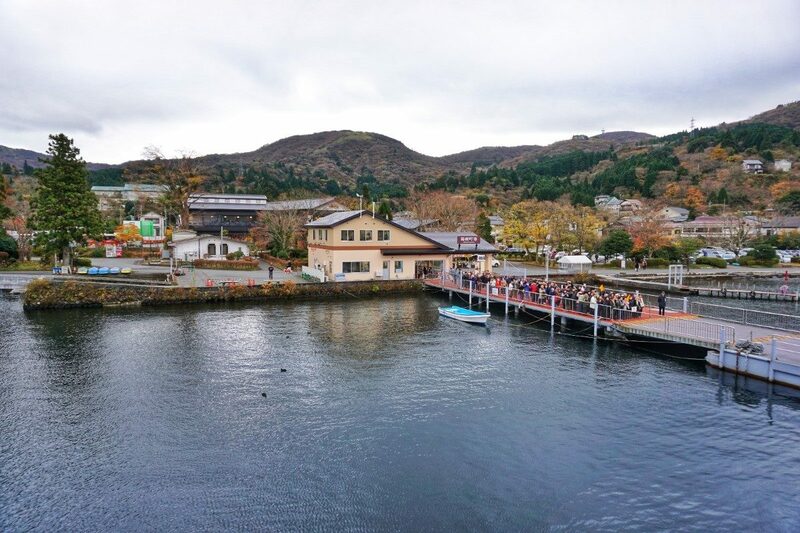 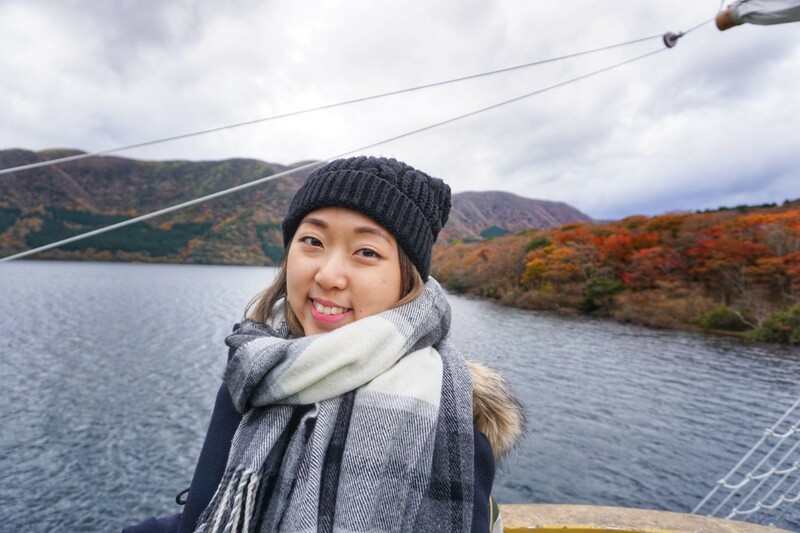 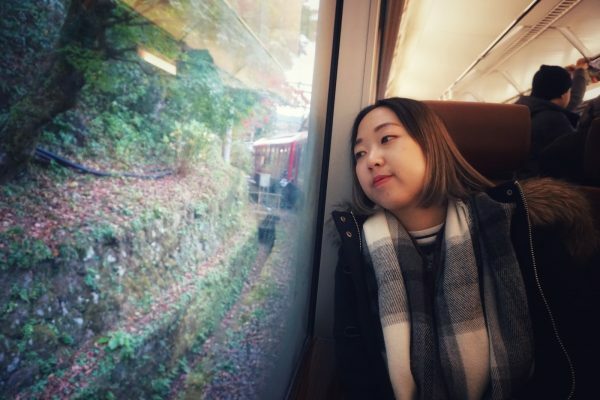 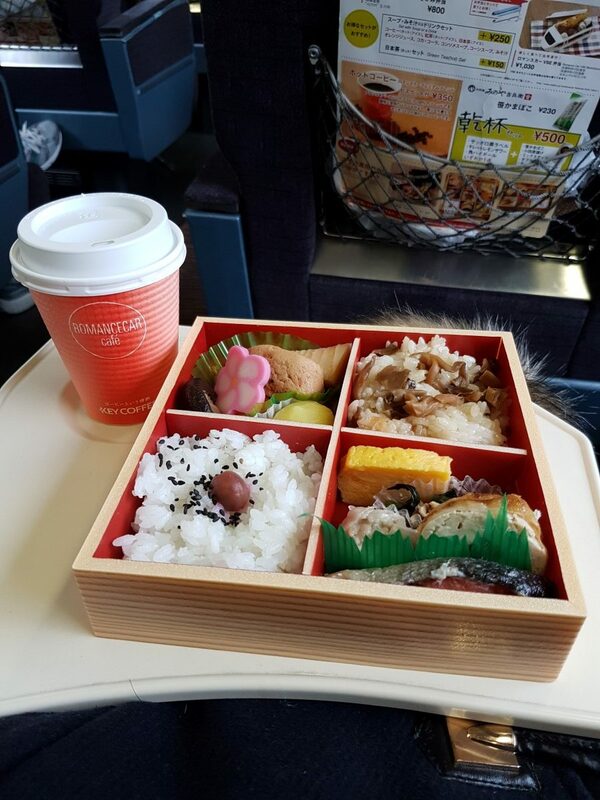 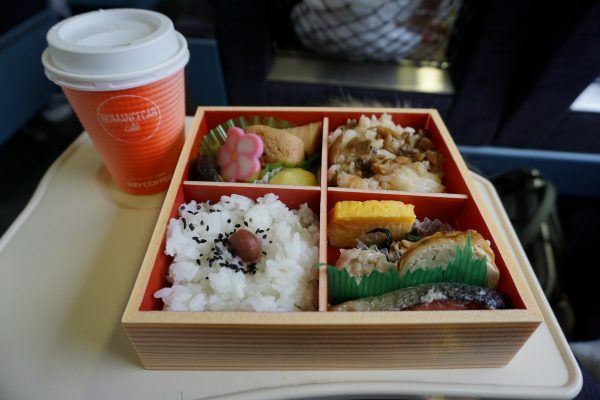 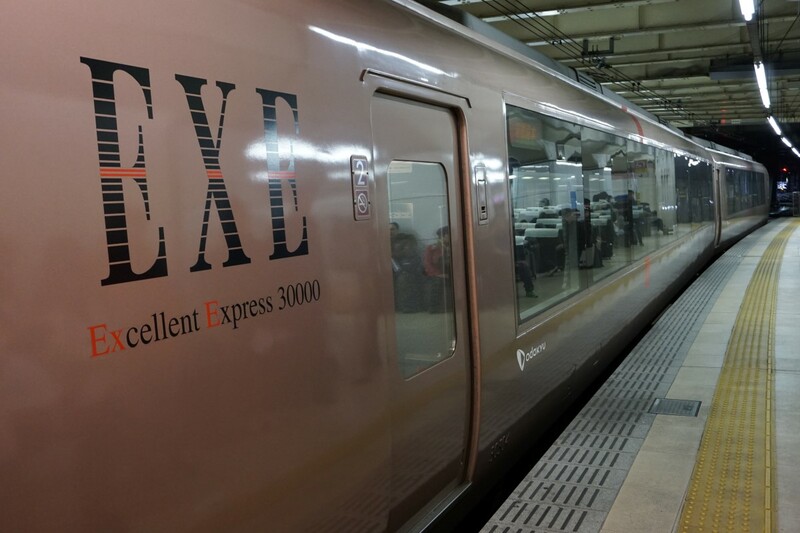 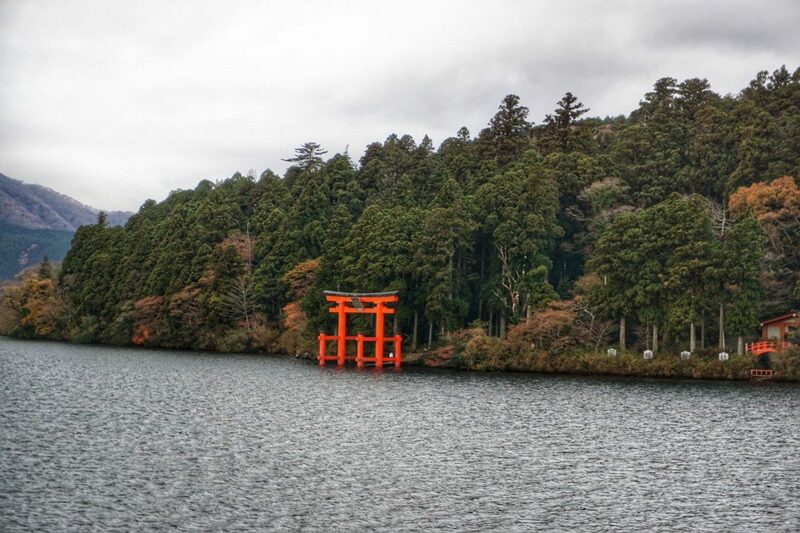 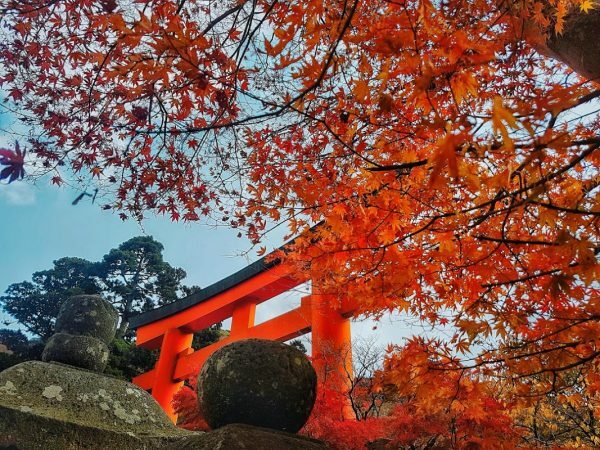 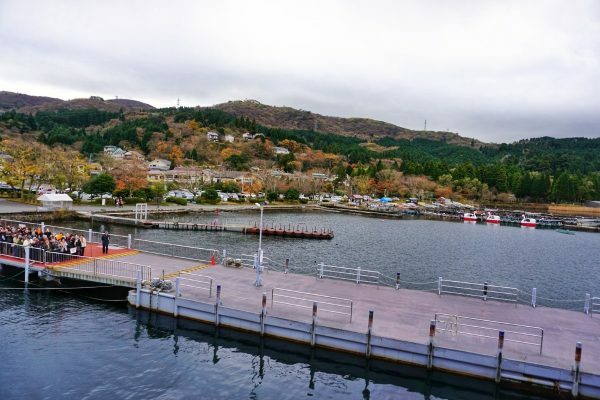 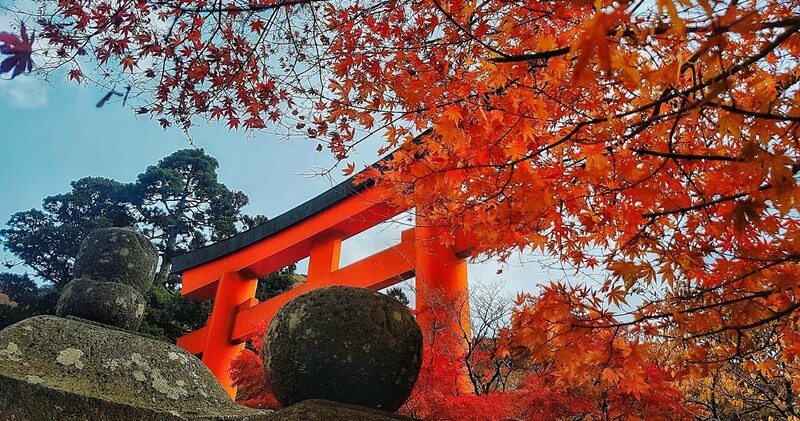 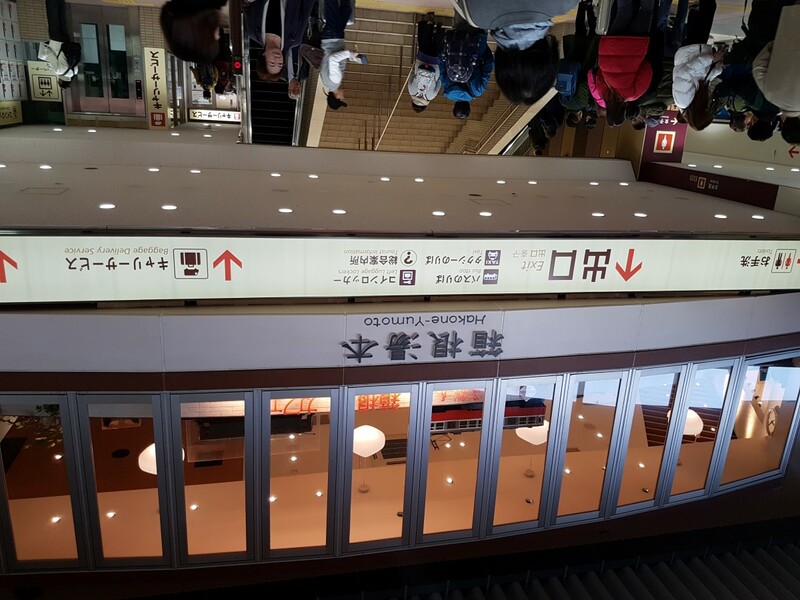 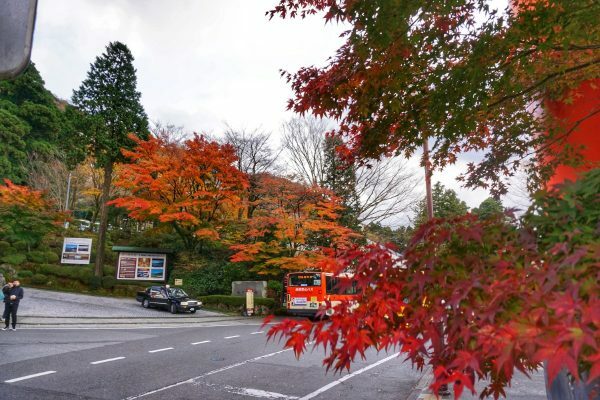 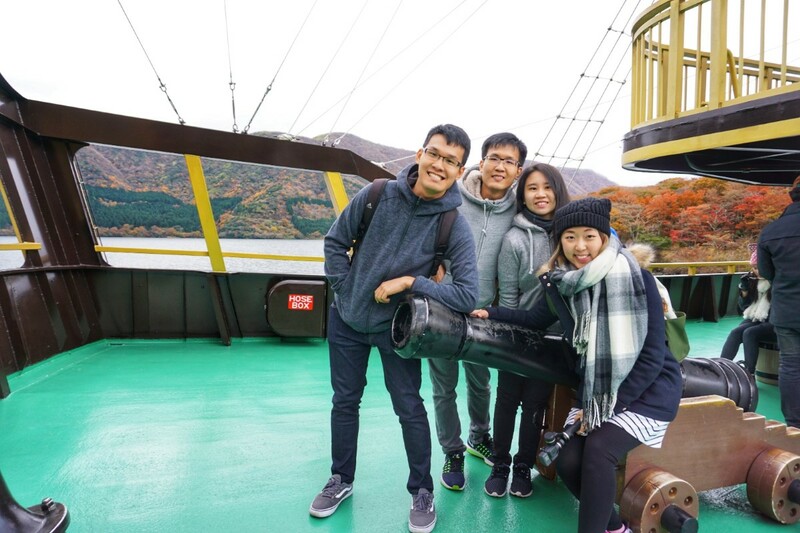 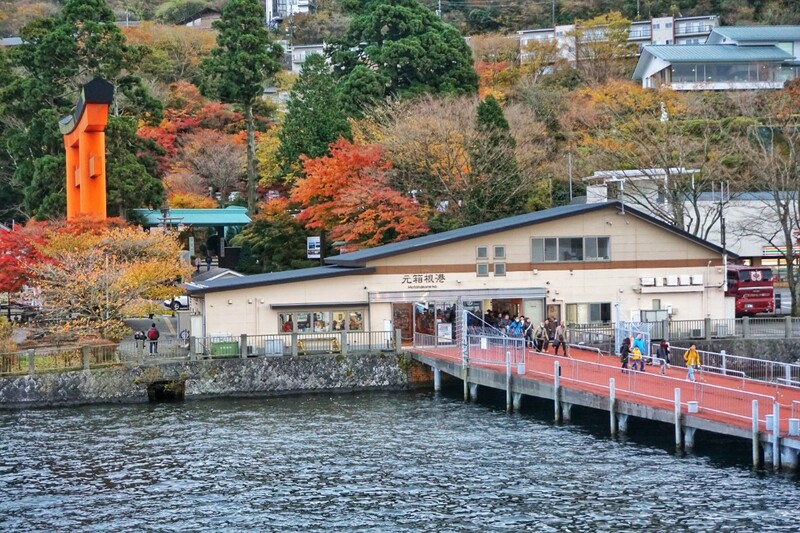 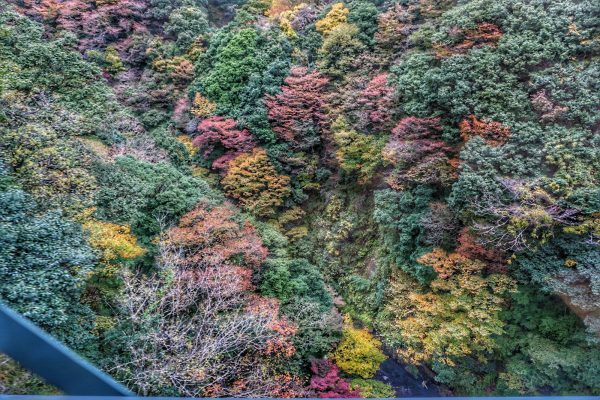 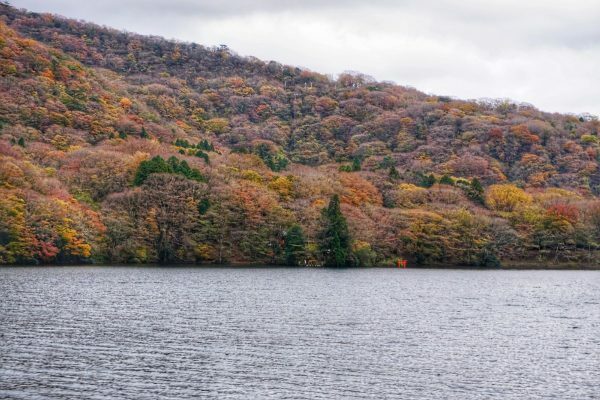 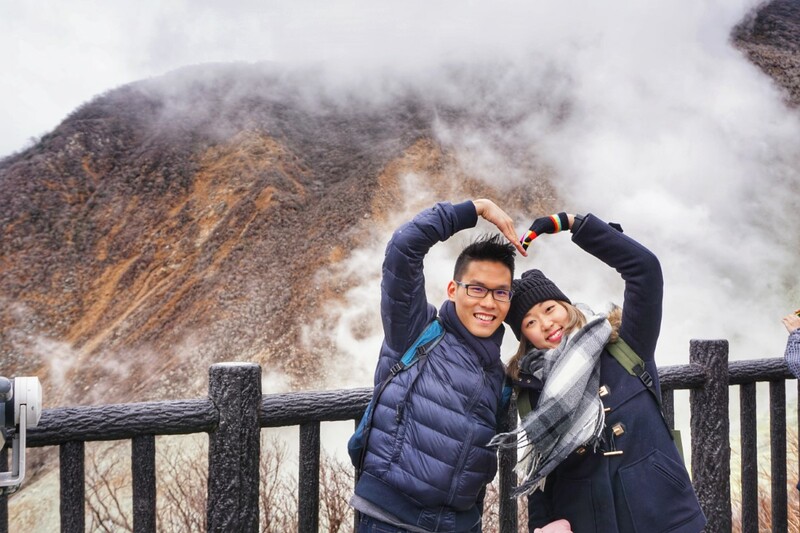 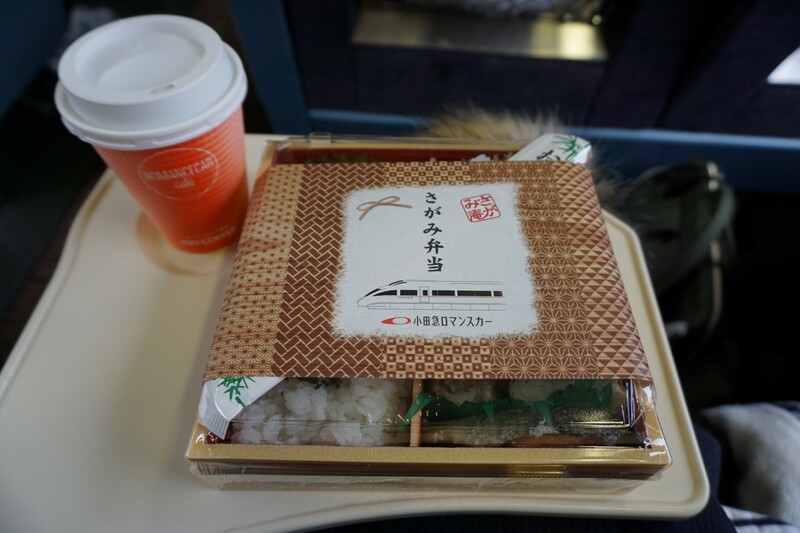 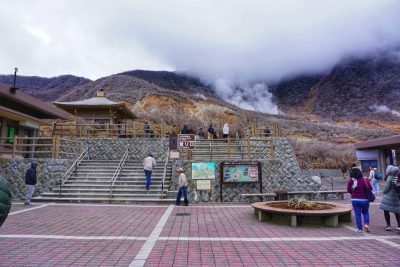 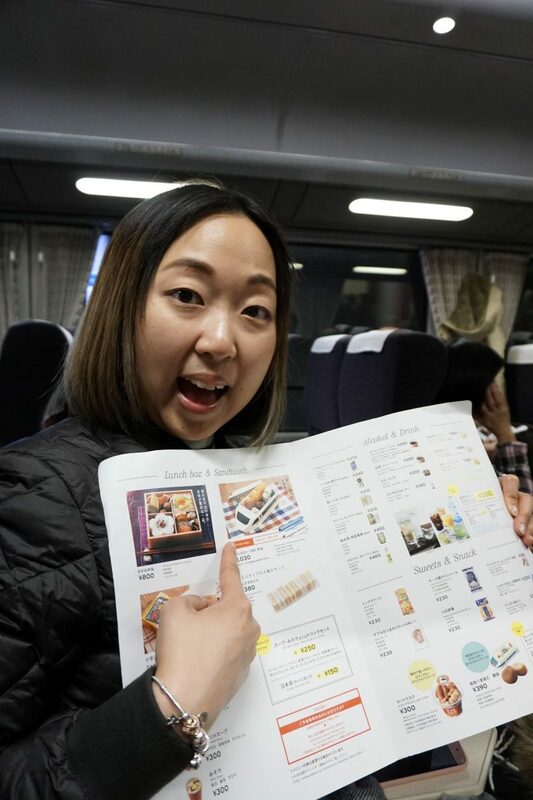 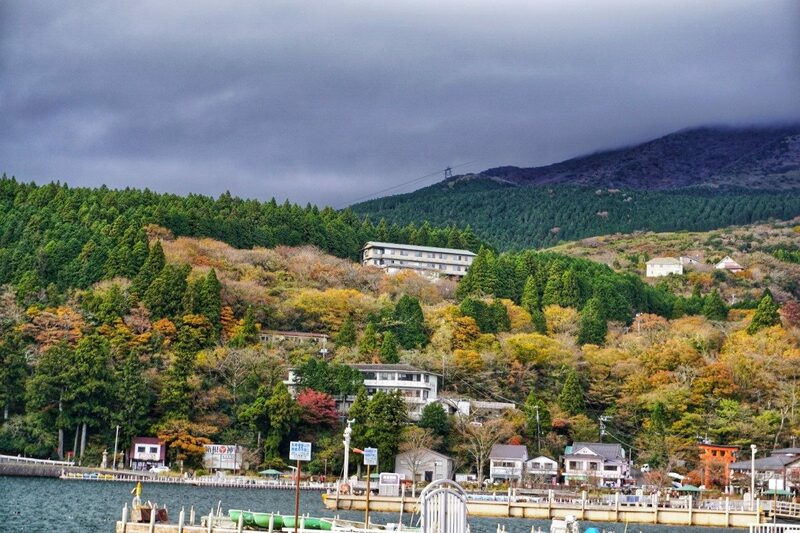 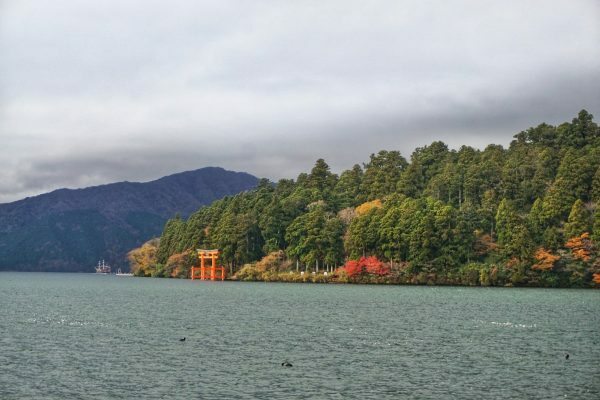 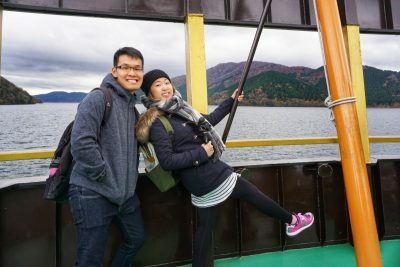 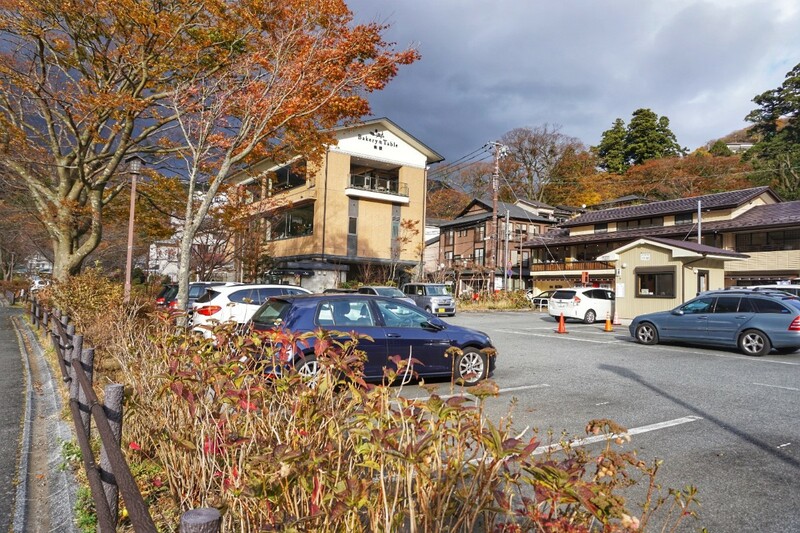 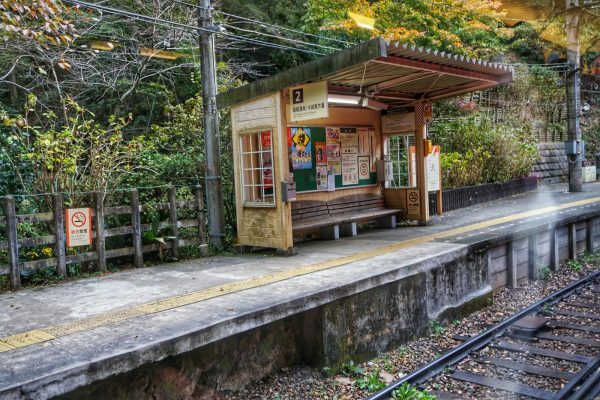 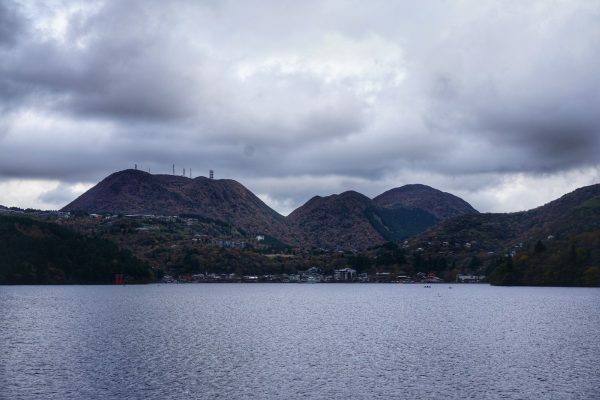 For today’s trip, we used Hakone Free Pass by Odakyu Railway which covered the round trip from Shinjuku to Hakone-Yumoto Station and also all the transportation in Hakone listed in this post. 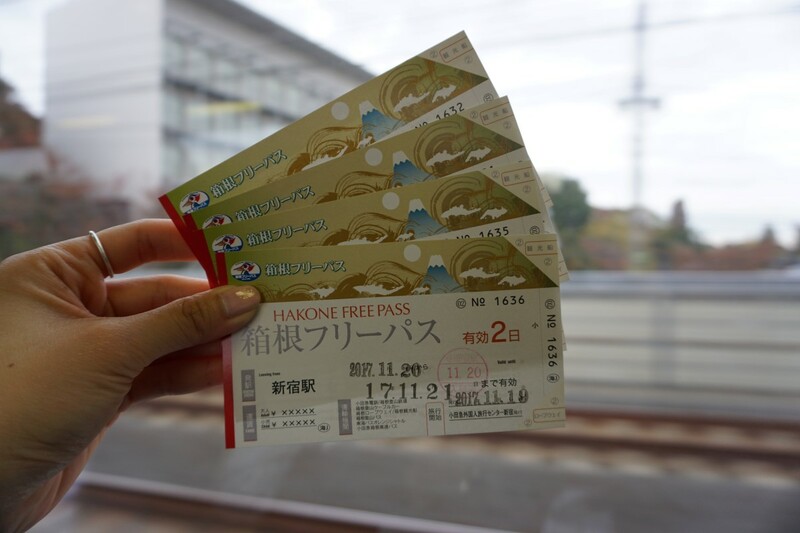 You can purchase your Hakone Free Pass online and collect the tickets at Shinjuku station before your trip. 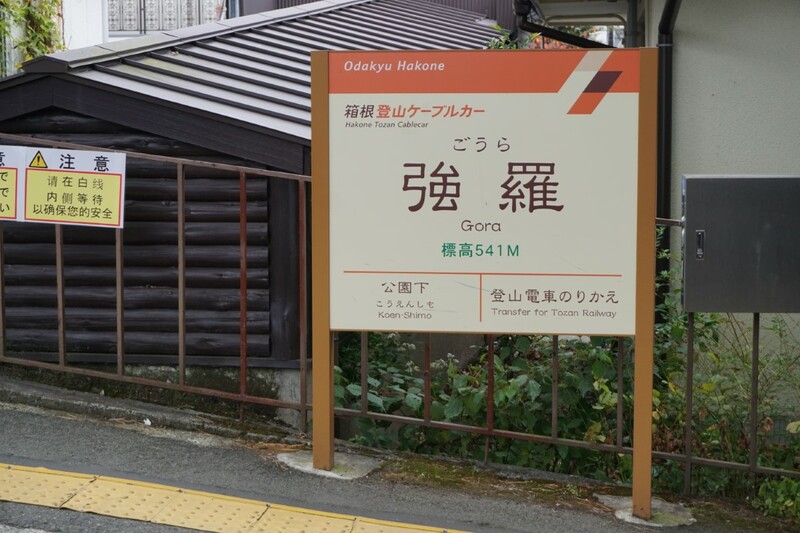 After one and a half hours ride, we arrived at Hakone Yumoto station to board our next ride, Hakone signature zig-zag train – the Hakone Tozan Railway. 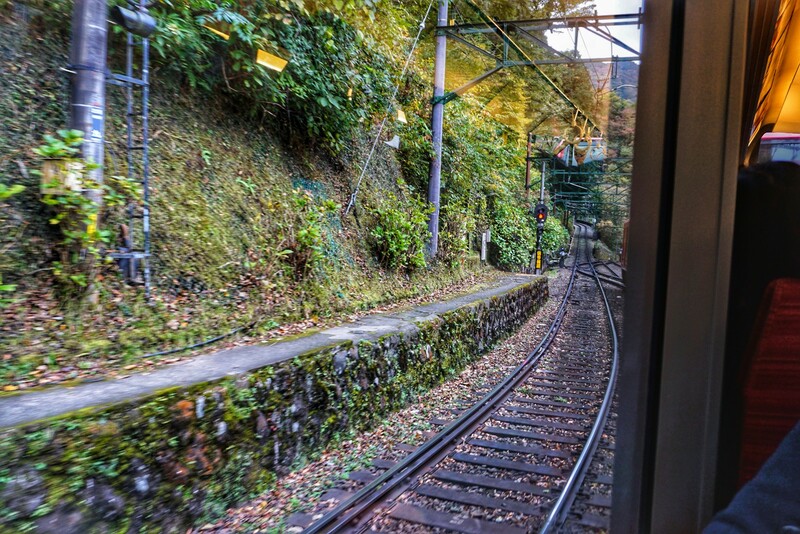 The Tozan train slowly made its way up at a steep angle, from Hakone-Yumoto station towards its final stop, Gora (541 m above sea level), reversing its travel direction at certain stops, which gave it the name zig-zag railway. 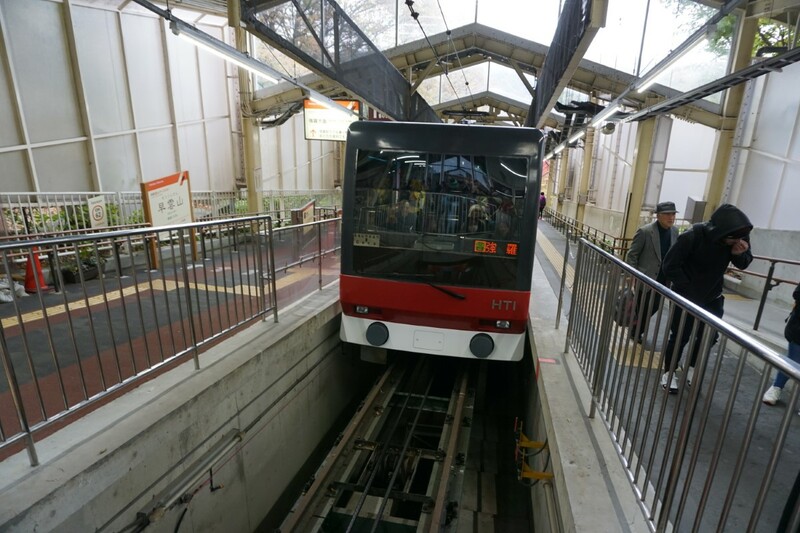 As it prepared to reverse its direction, the driver and the conductor would alight from the train and changed from one end to the other to operate the train. It was a nice and relaxing ride with beautiful autumn colours outside our window. 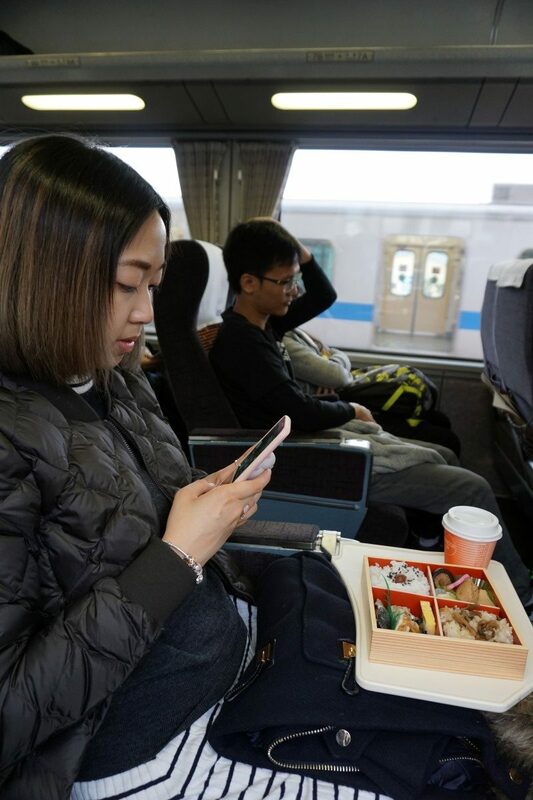 But the train was packed with tourists, so you gotta be lucky (and early) enough to get a window seat. 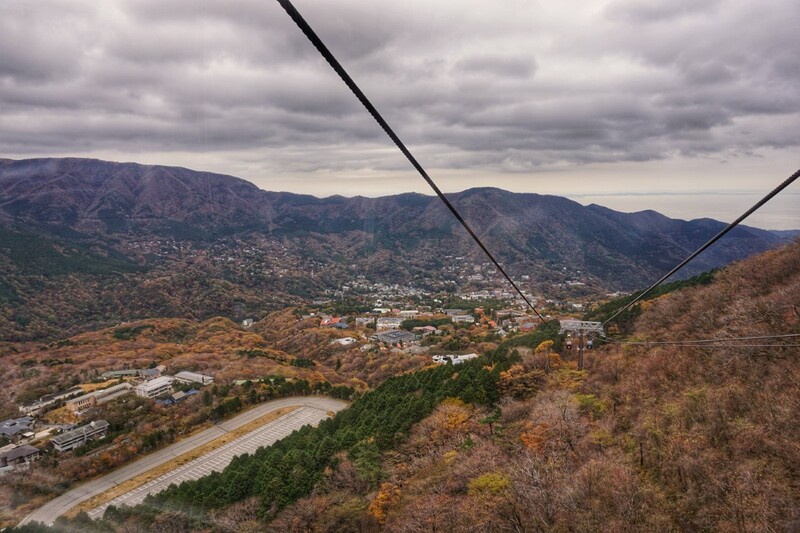 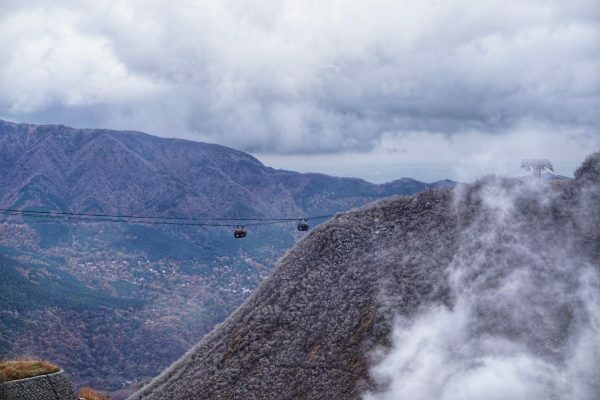 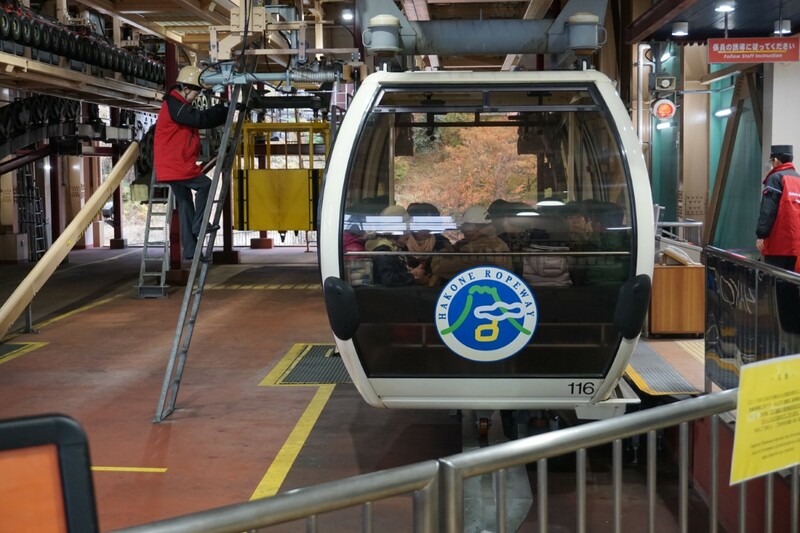 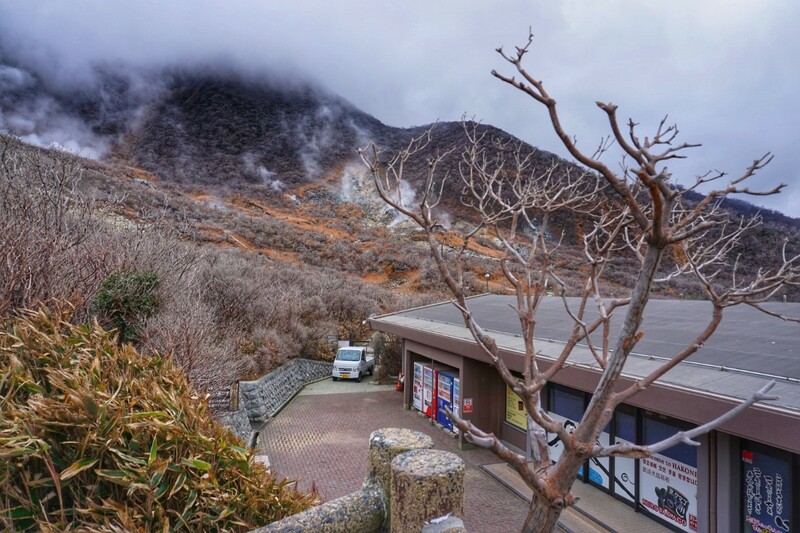 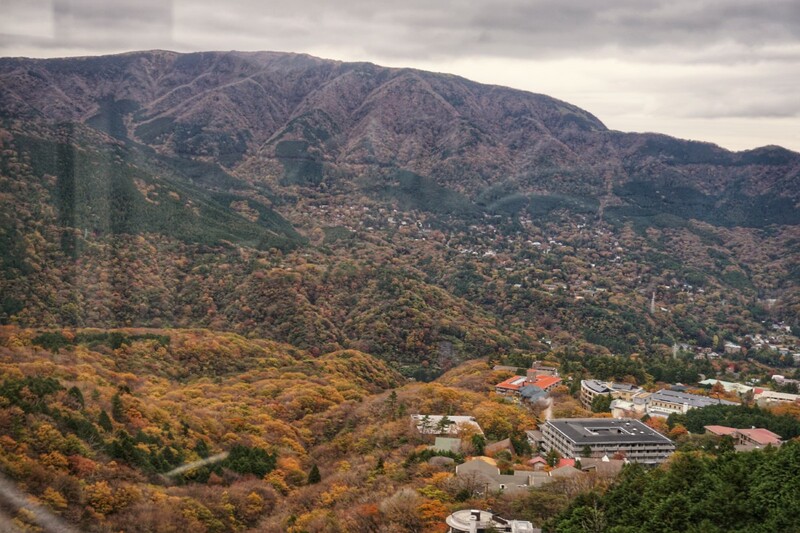 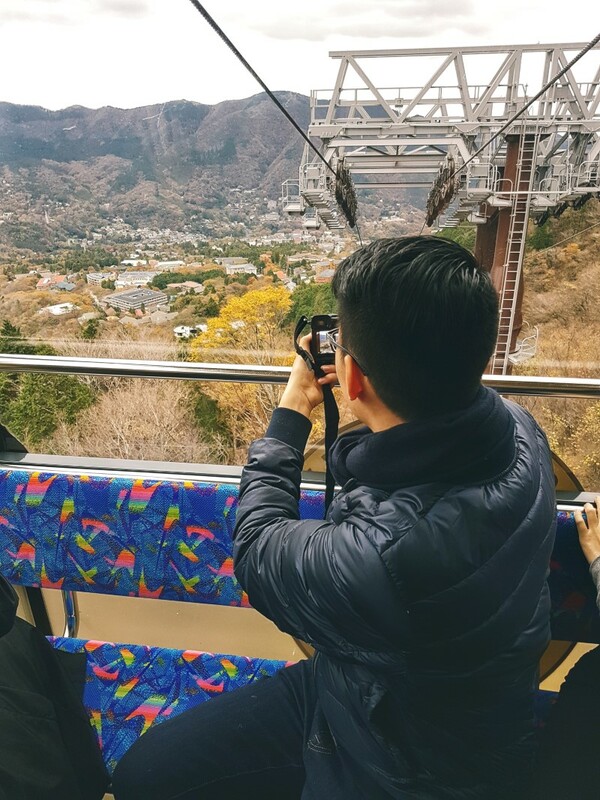 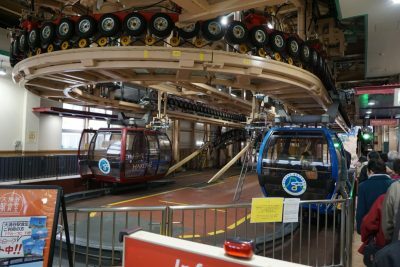 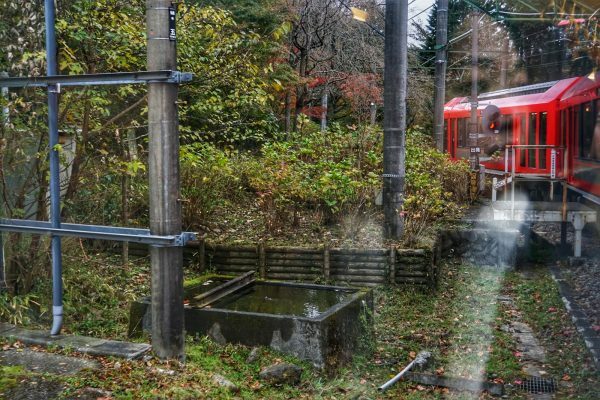 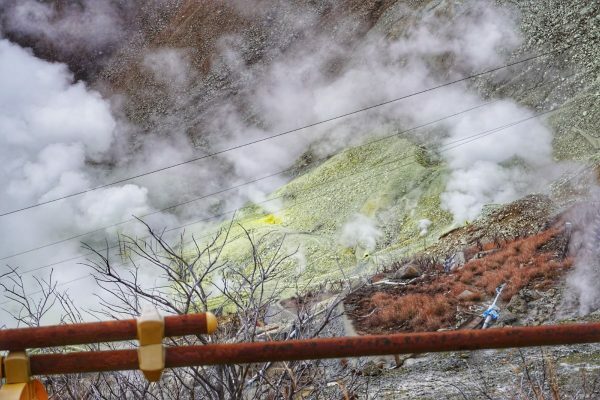 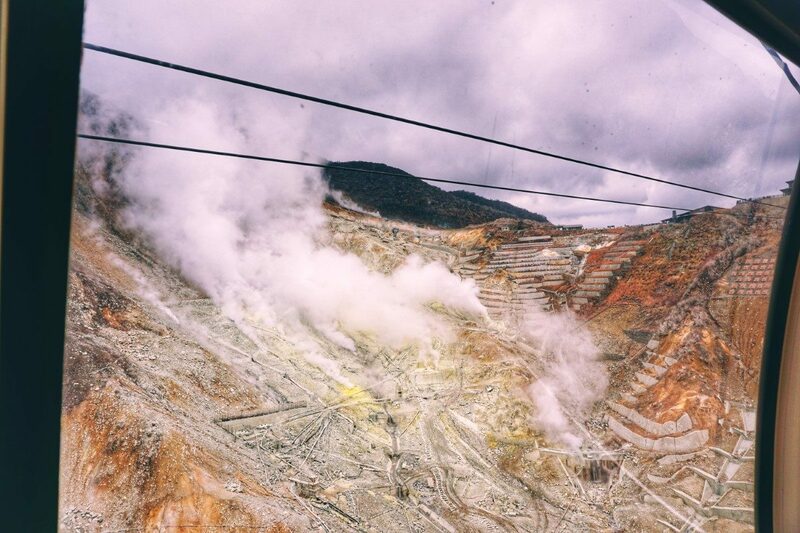 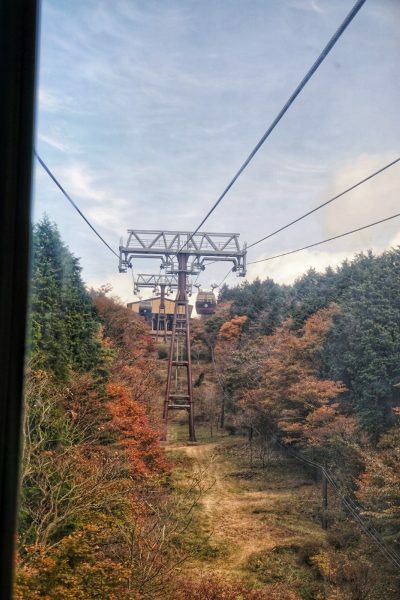 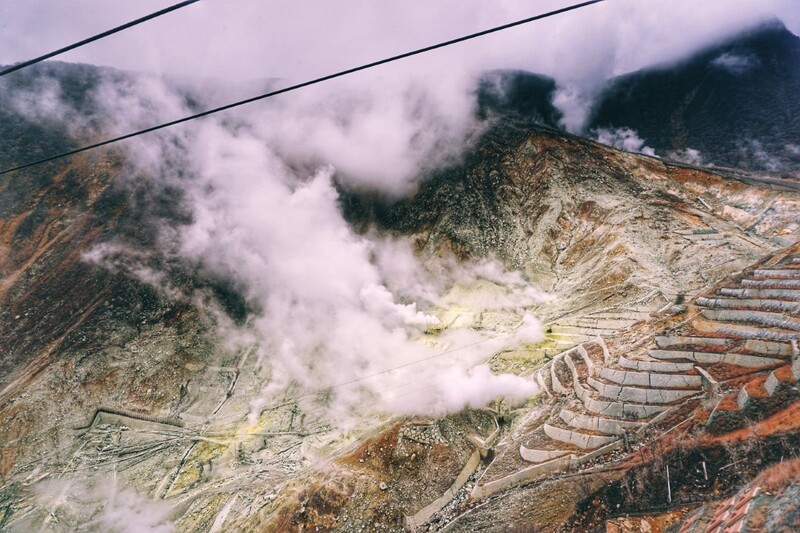 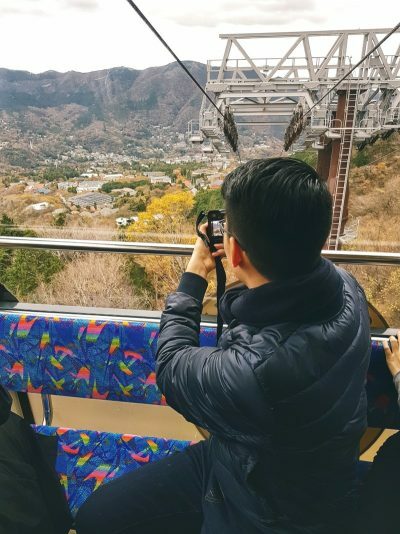 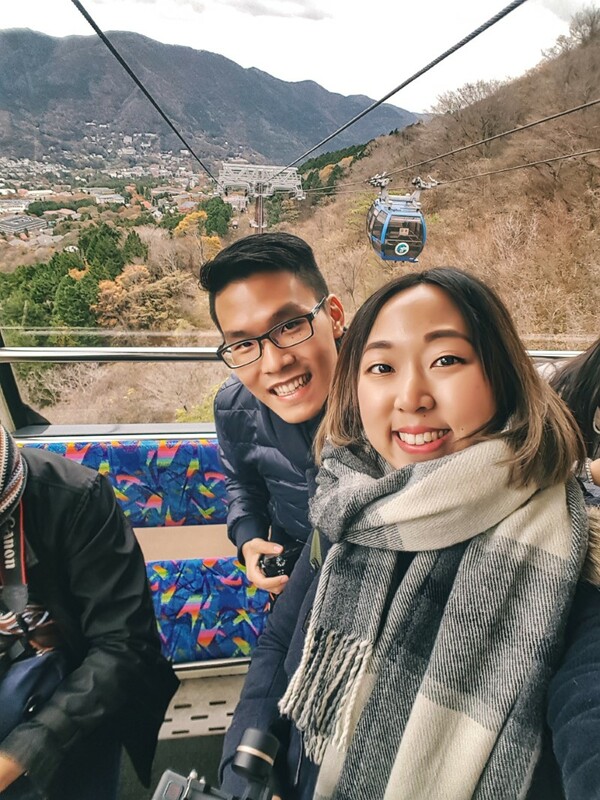 At Gora, we boarded the Hakone Tozan Cable Car towards Sounzan station, where we hopped on the Hakone Tozan Ropeway towards Ōwakudani 大涌谷 (meaning great boiling valley). 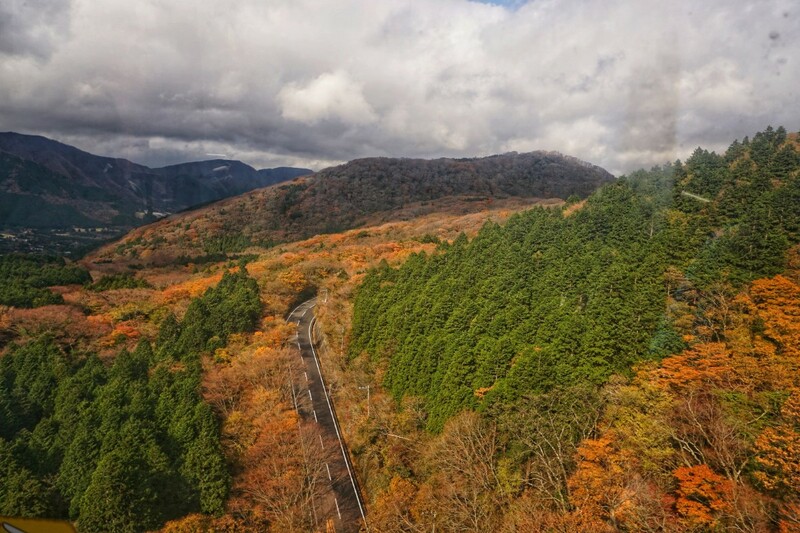 We were greeted with a scenic end-of-autumn view of mountainous terrains at the beginning of our journey. 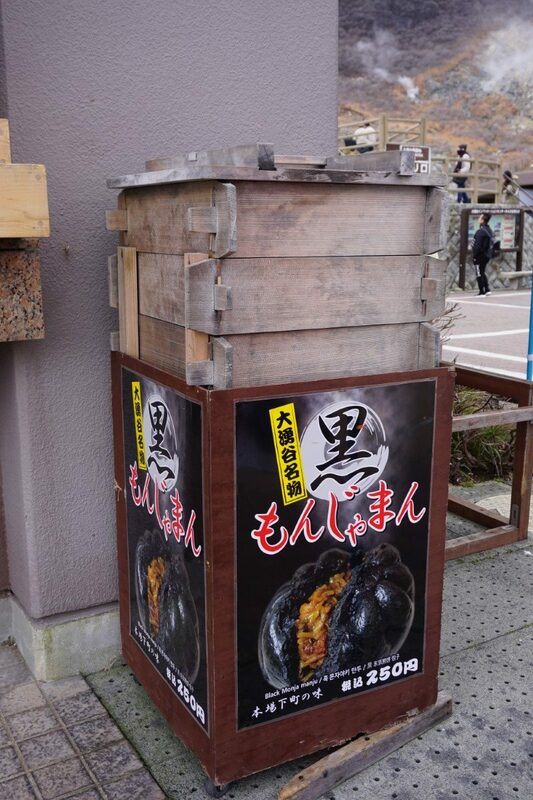 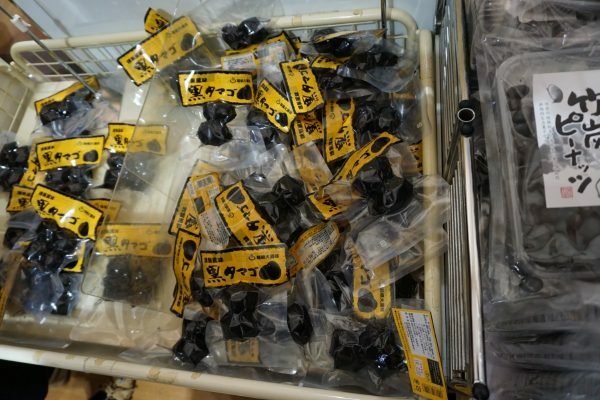 The next thing to do was definitely to try some famous lifespan-prolonging Owakudani black egg. 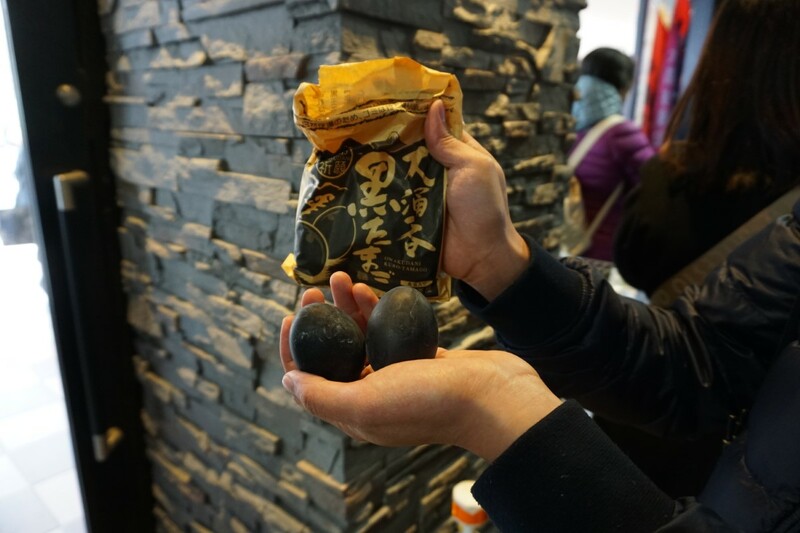 These chicken eggs were boiled in the sulphurous spring, hence turning their shells black. Legend has it that eating one black egg would prolong your life by 7 years! 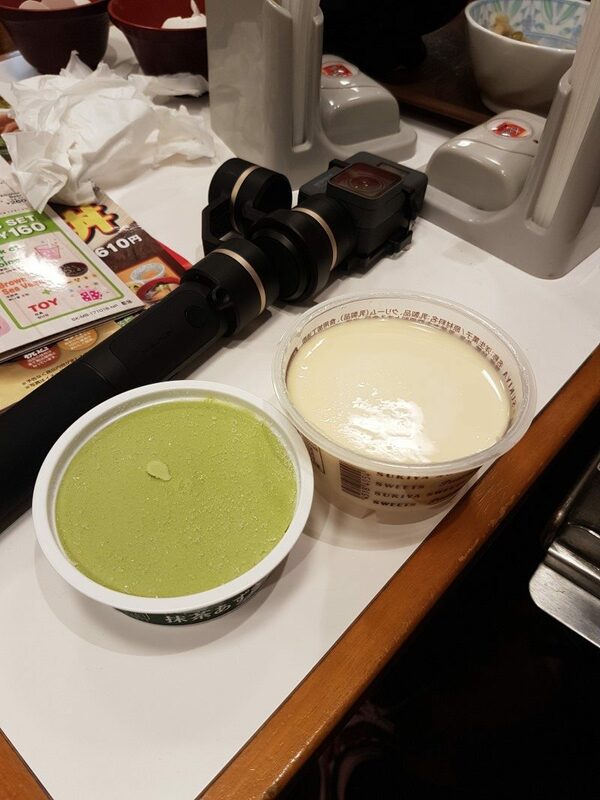 However, you can’t be too greedy. Some say you shouldn’t have more than two. 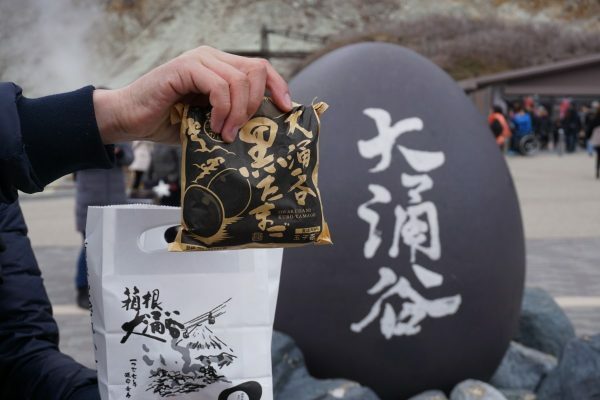 I have waited two years for these eggs because there was a prediction for volcanic activity the last time I was at Hakone. 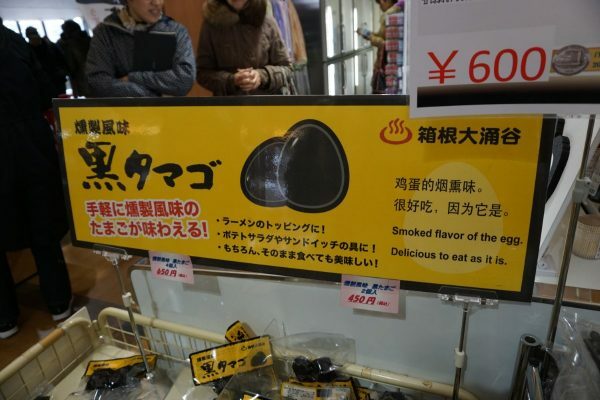 So these eggs deserve multiple headshots (or egg-shots, I suppose). 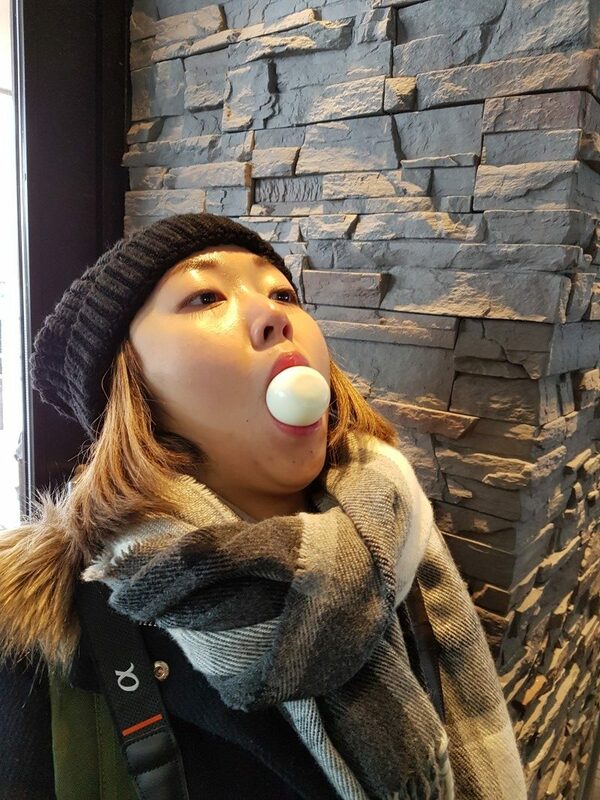 I look like a happy penguin with her egg. Smoked-flavoured egg, if you want some to-go. 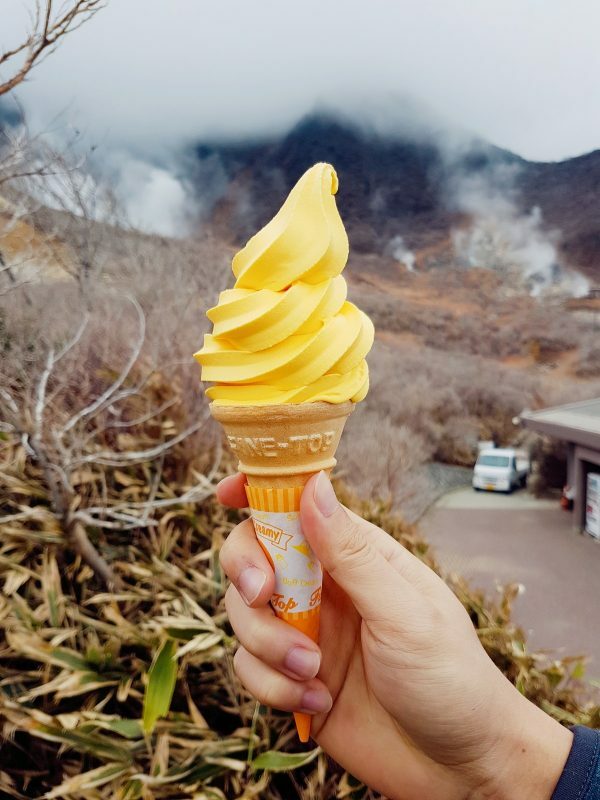 Another must-try has got to be the tamago (egg-flavoured) ice cream. Don’t be worried about eating ice cream in the cold, it actually makes you feel warmer! 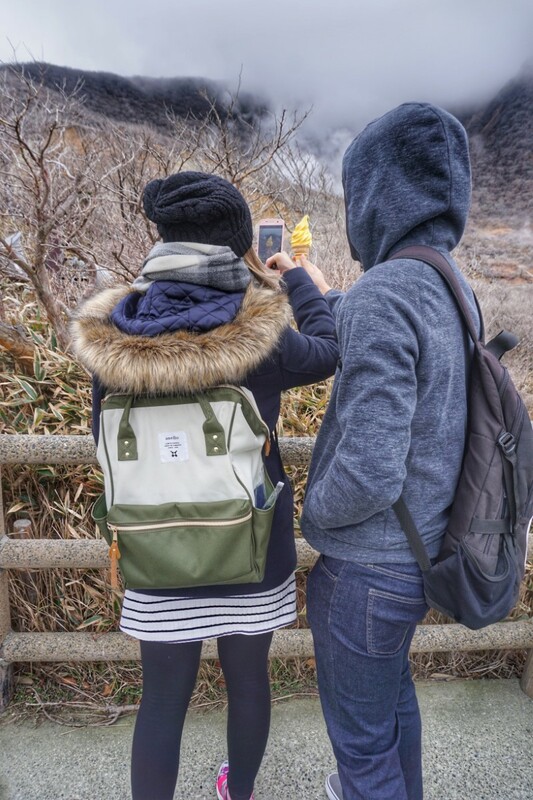 I especially love this behind the scene shot. 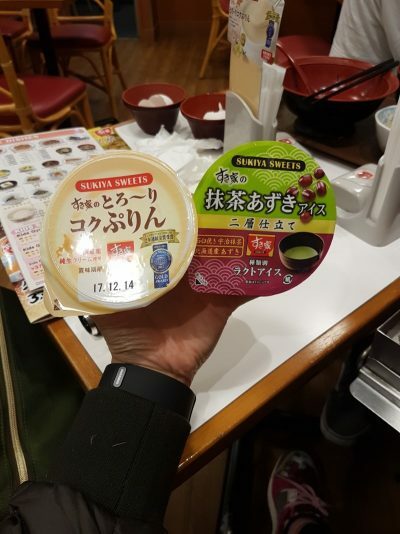 I also love this full cream (or should I say heavy cream lol) Hakone milk and this black monja manju. 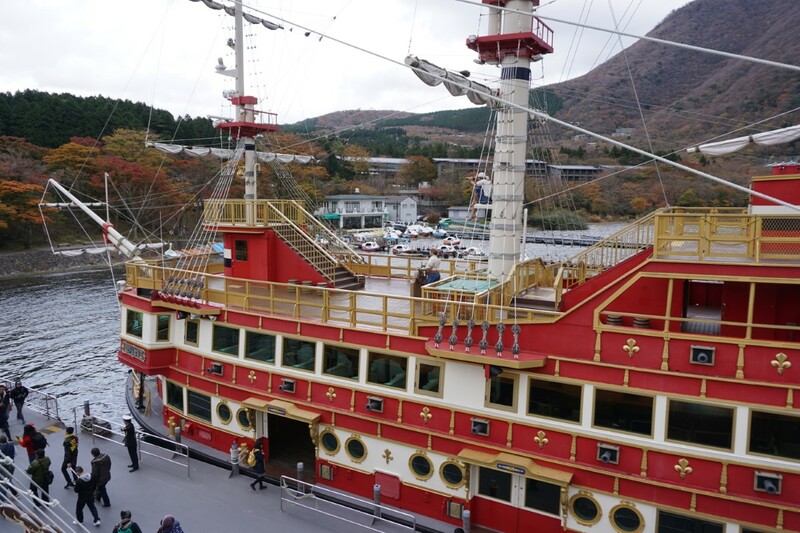 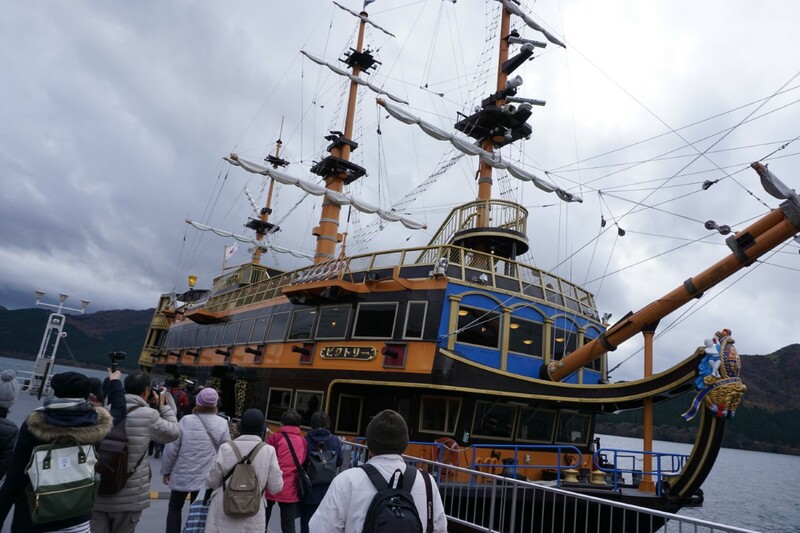 We then take the ropeway to Togendai-Ko to board our pirate ship. 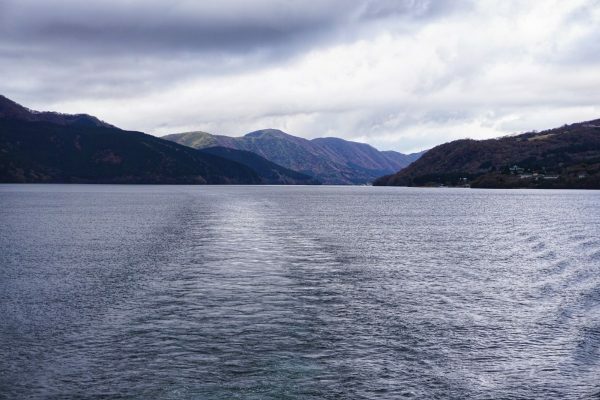 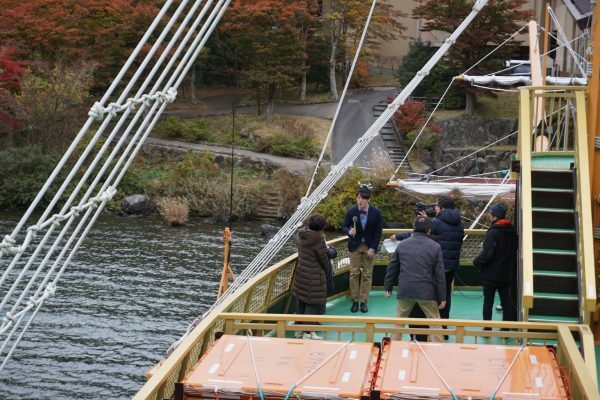 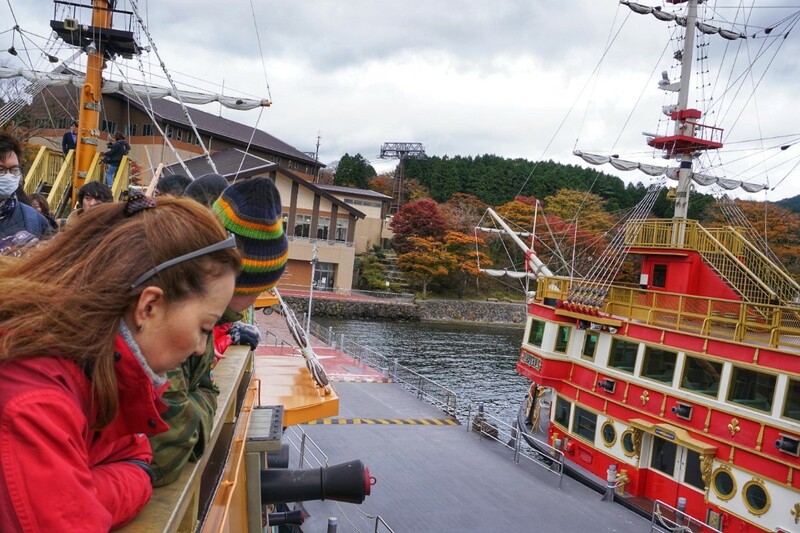 It was a 25-minute sightseeing cruise to Hakonemachi-Ko and another 10-minute sail to Motohakone-Ko. 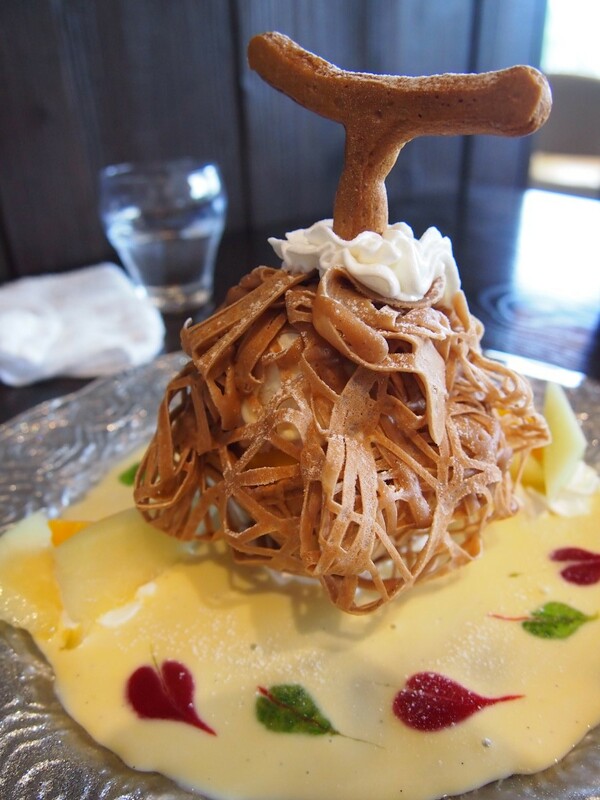 And we are here back at Motohakone, where we had this amazing melon crepe dessert at this restaurant called Bakery & Table nearly 2 years ago. 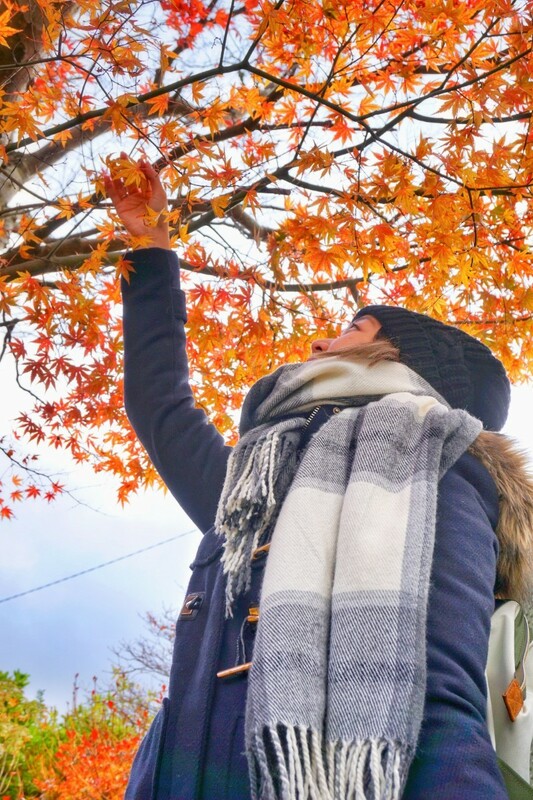 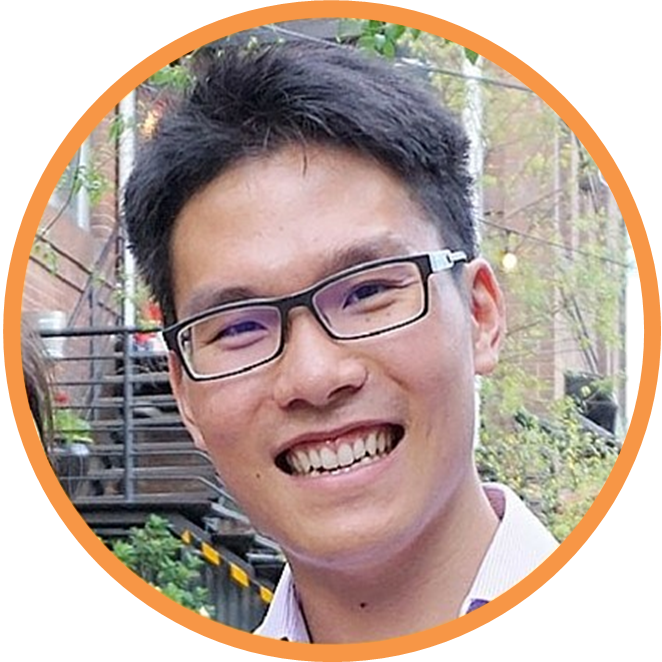 Check out the full post here. 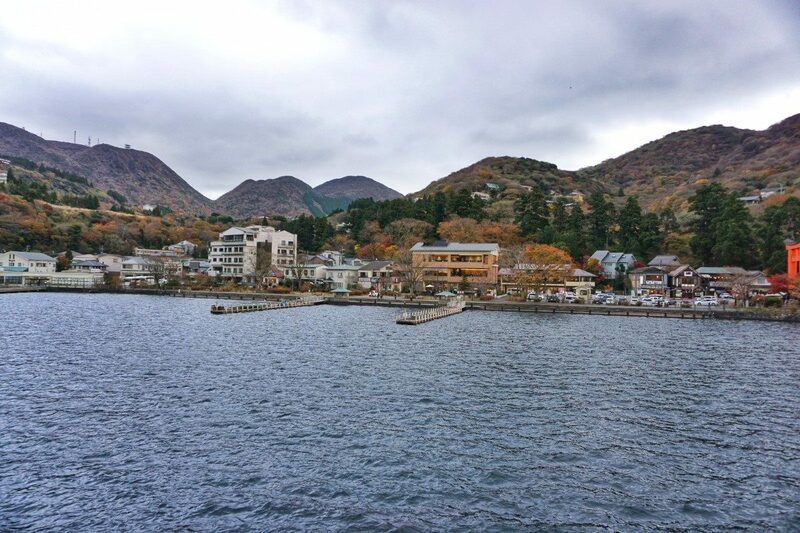 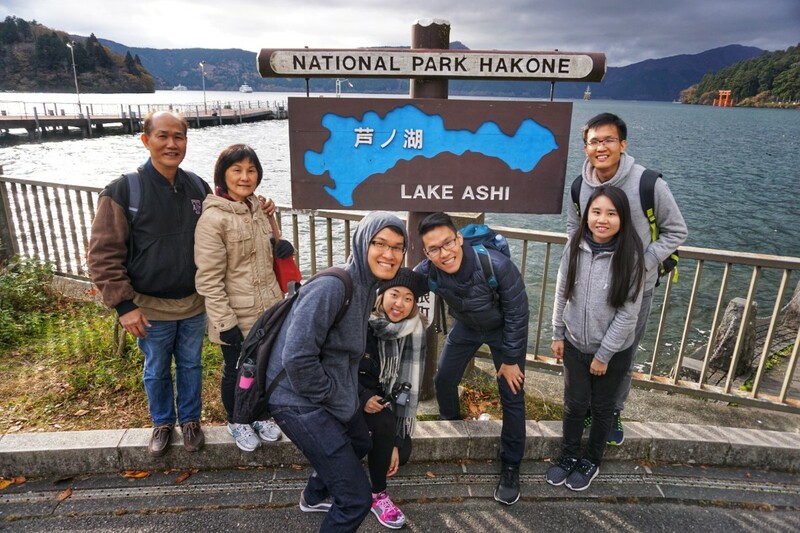 Had a stroll along Lake Ashi before heading to Motohakone bus stop. Grabbed a pokemon themed Ito-en vegetable juice from the vending machine at the bus stop before grabbing the bus to Yumoto 湯本. 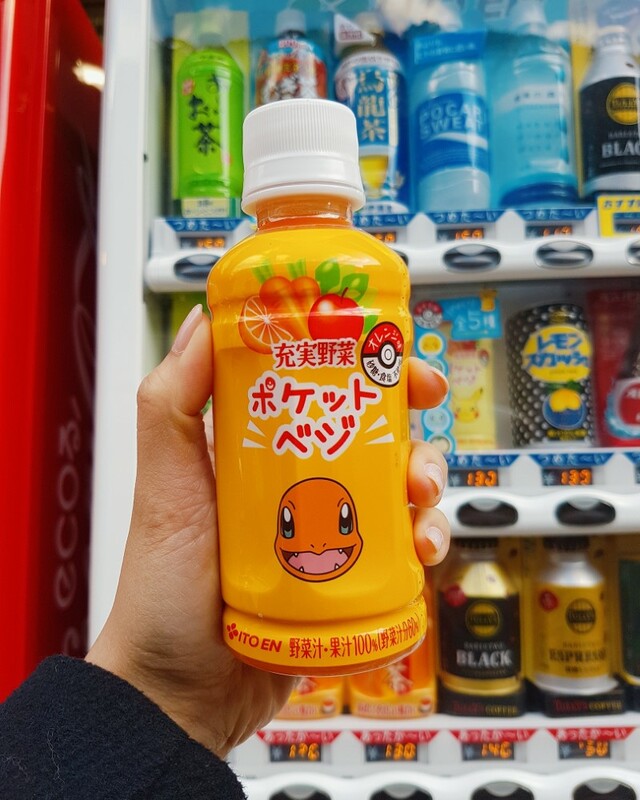 I’d always love Japanese vending machines. They are literally everywhere, at every alleyway, every nook and cranny. 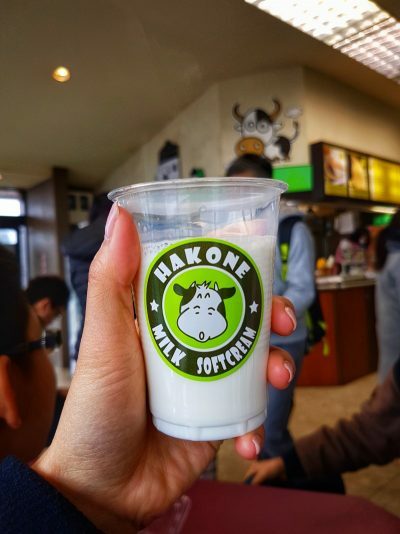 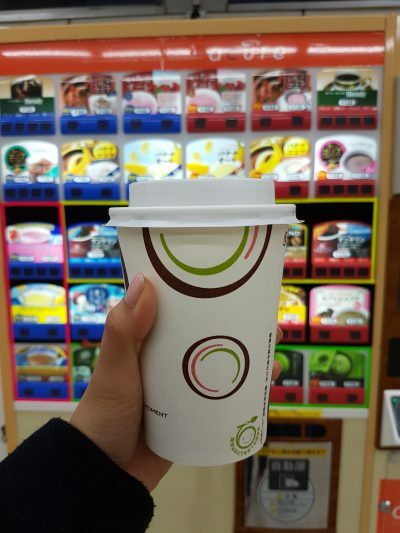 Each of them offers a different variety of drinks and some even sell hot beverages or hot soup! You might remember that Nanaya ななや matcha vending machine I found in Narita station in my previous post (if not, look at that glorious vending machine below). 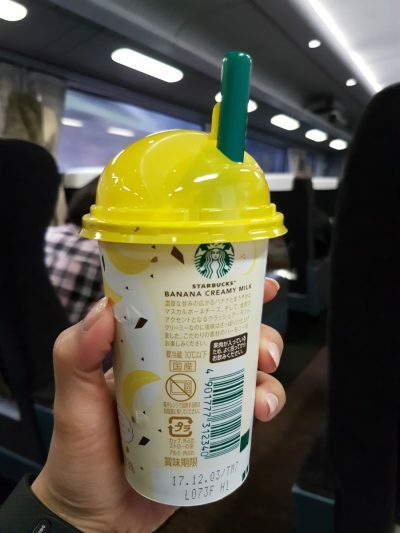 It was only ¥140 for a large size! 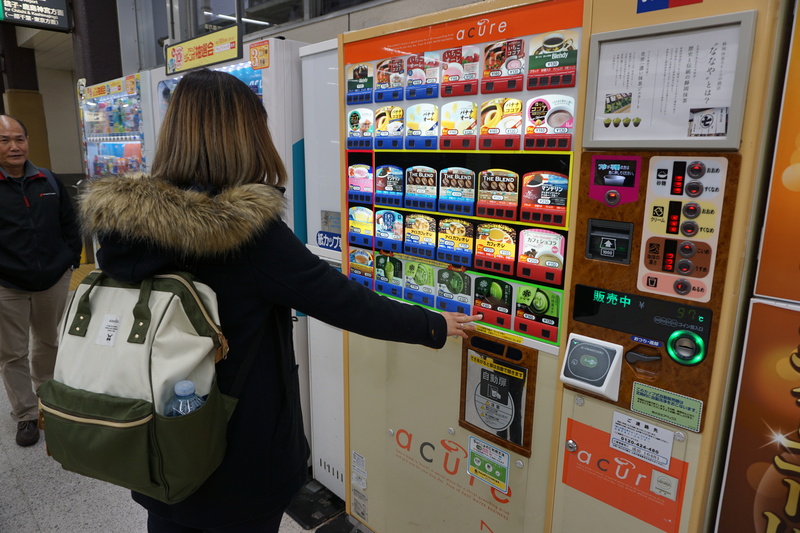 Unlike the vending machines that I usually see in Sydney, these machines are actually reasonably priced. 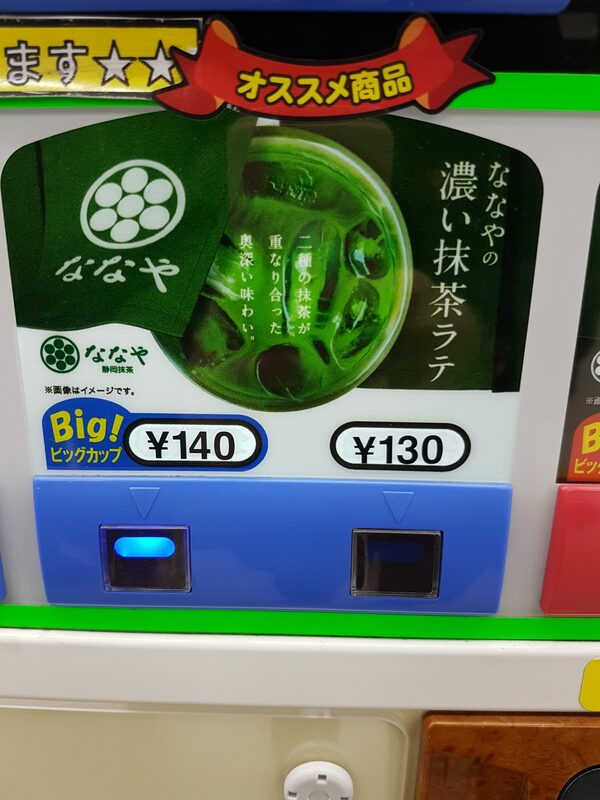 Hence I can’t get my hands of these machines and you’d probably find me feeding coins into them at least three times a day. There were a few interesting shops at Yumoto 湯本 selling local souvenirs and snacks. 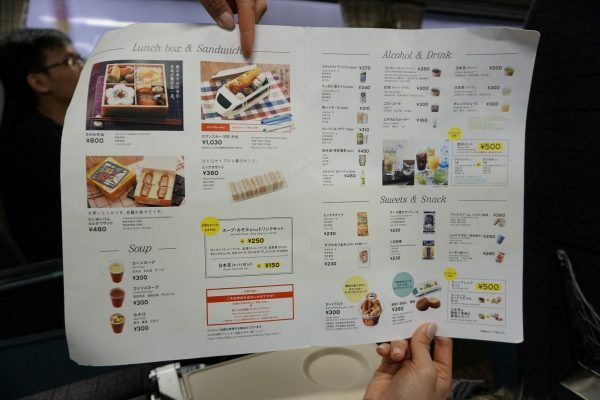 I was only interested in the snacks department since we were all pretty hungry. 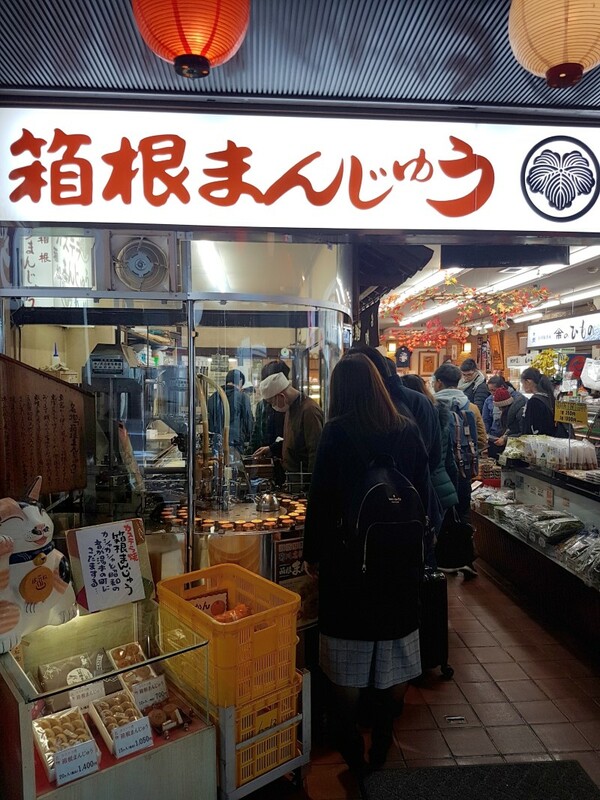 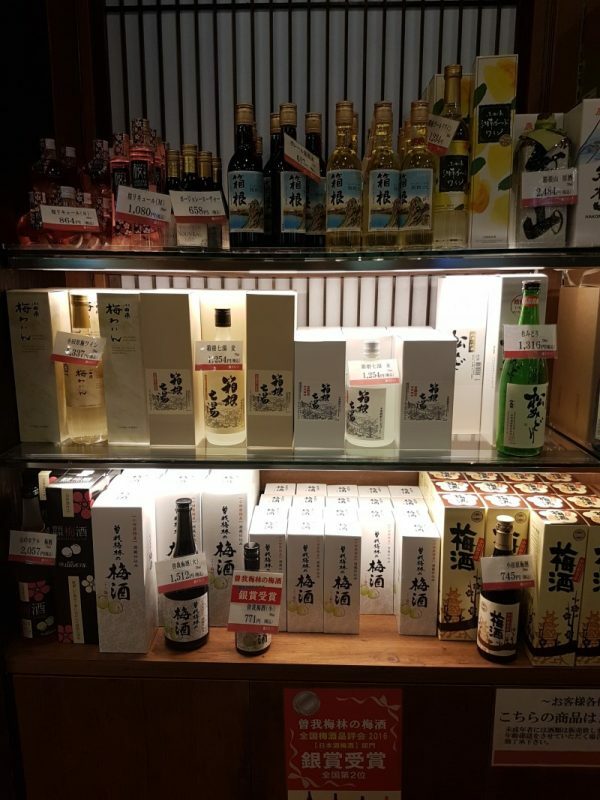 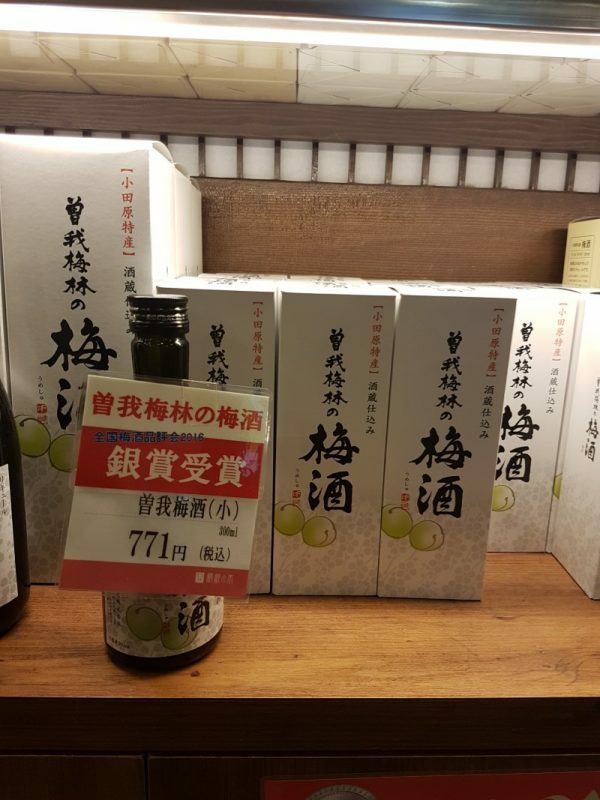 One shop that you can’t miss, and definitely won’t miss since there is always a long queue flooding it, is the Kagoya Seijiro (籠屋清次郎). 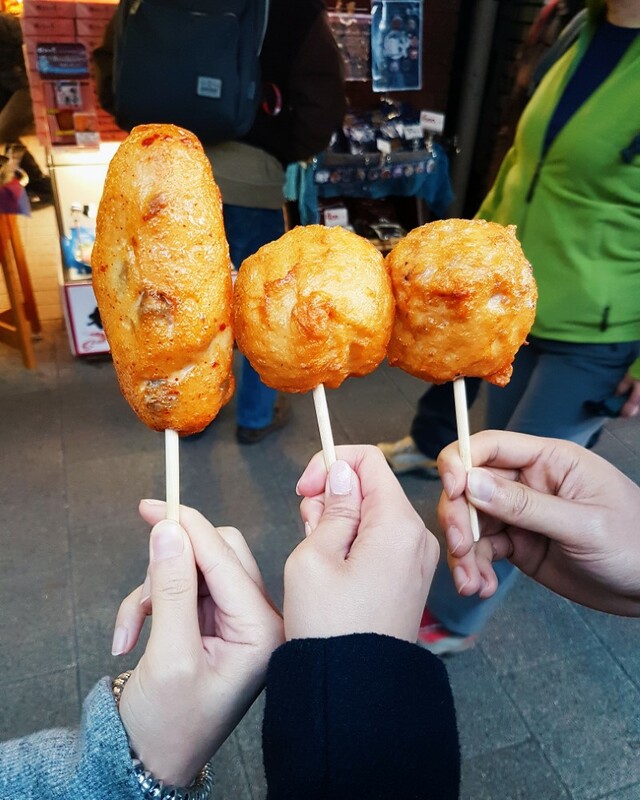 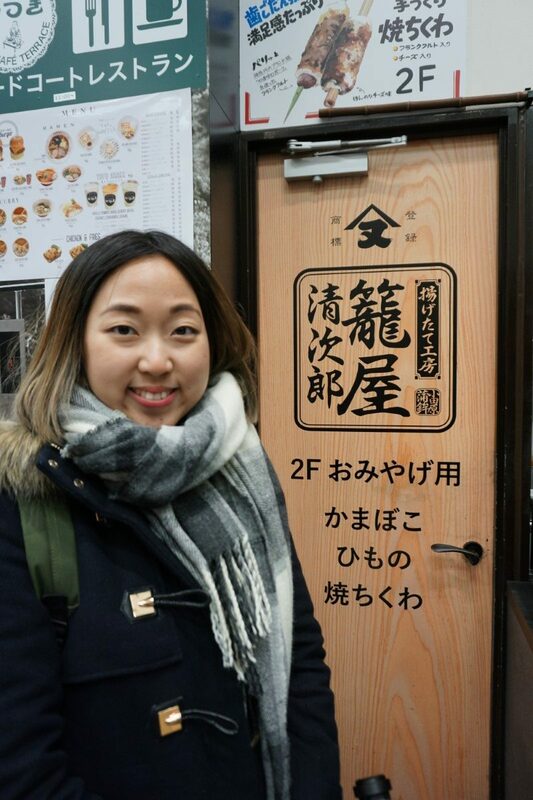 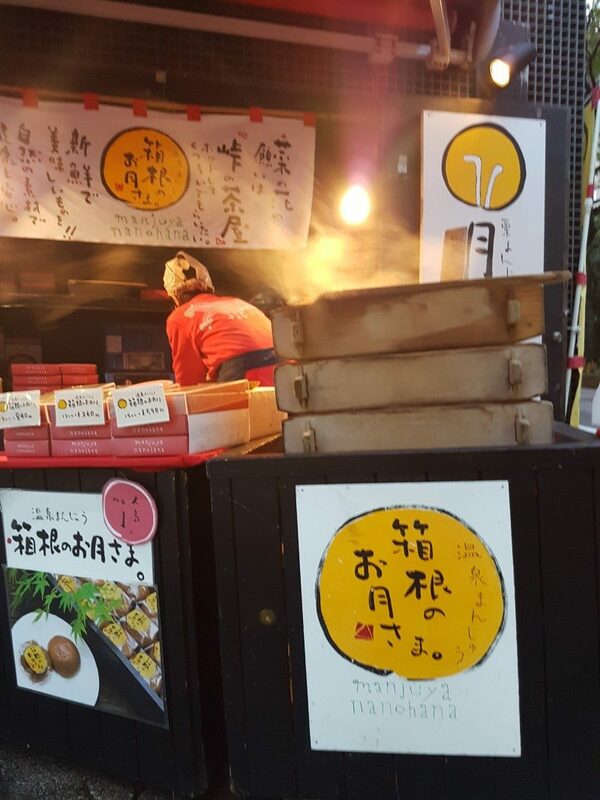 Kagoya Seijiro, founded back in 1814, is famous for their freshly-fried fish cakes on skewers. 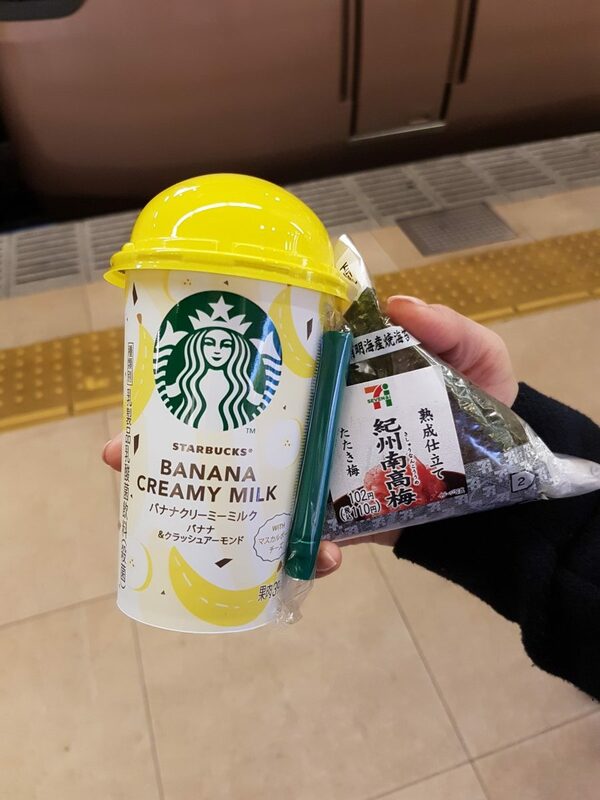 Super yummy especially on a cold day! 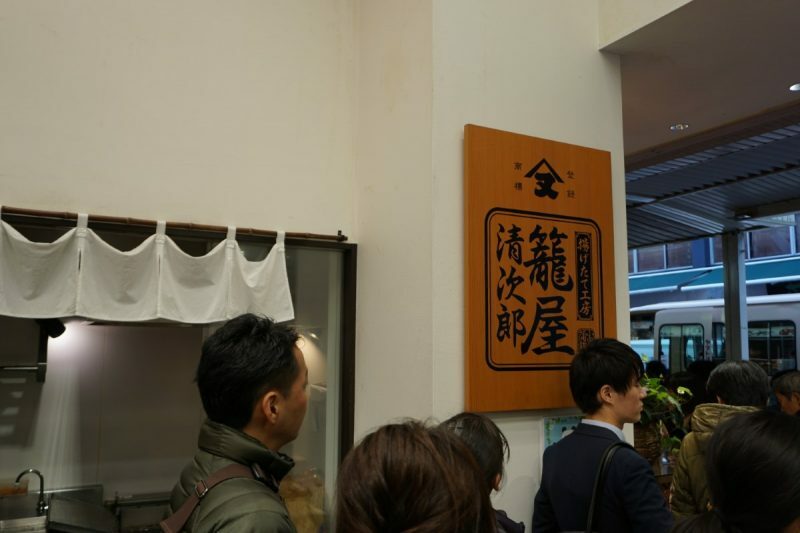 Another famous snack/souvenir shop is the Kikugawa Shoten (菊川商店), which sells a variety of local Hakone sweets and snacks. 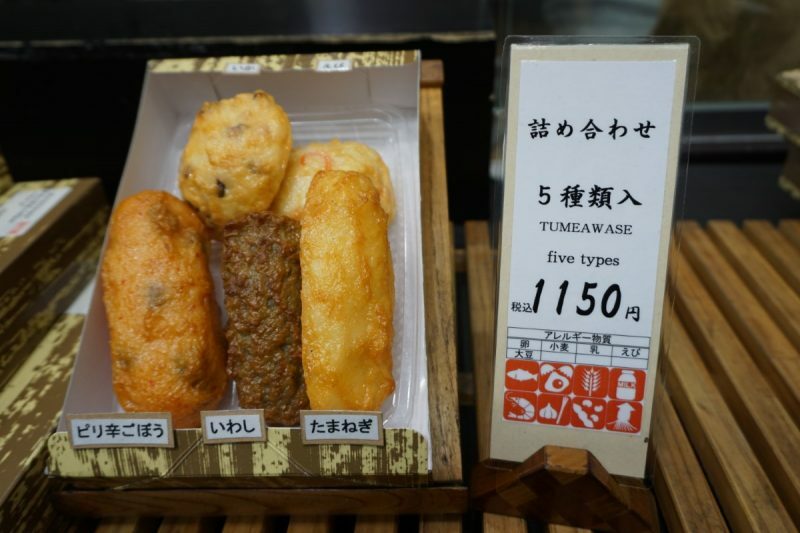 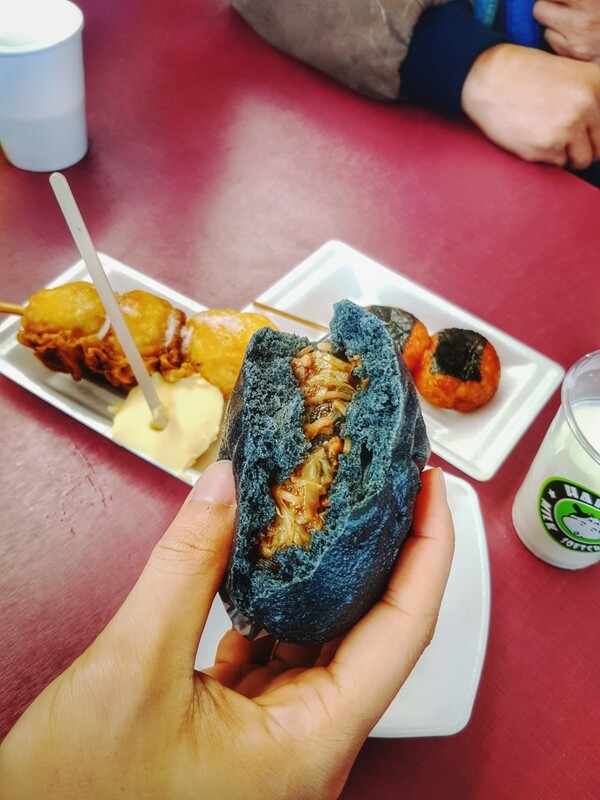 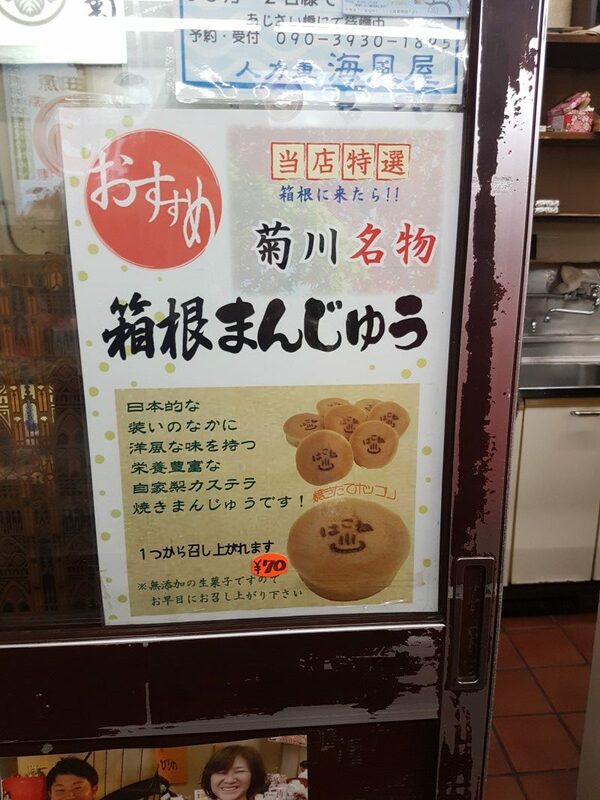 Their winning product is the Castella-yaki Hakone Manju with sweet white azuki bean paste filling, which is made fresh in store with their automated machine. 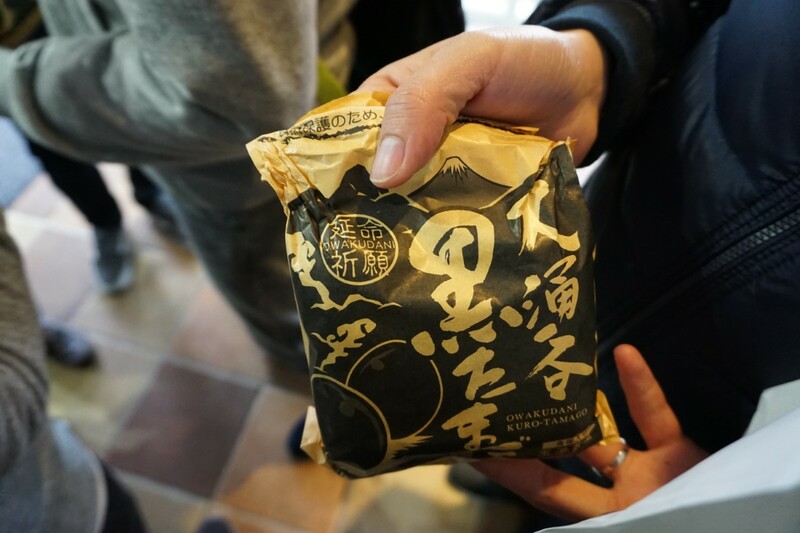 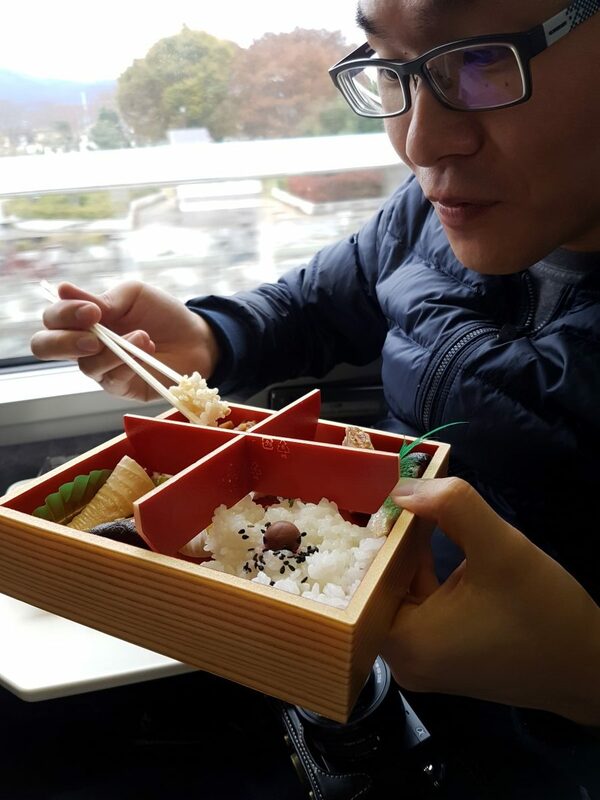 We tried another traditional sweet before we left for Hakone-Yumoto Station. 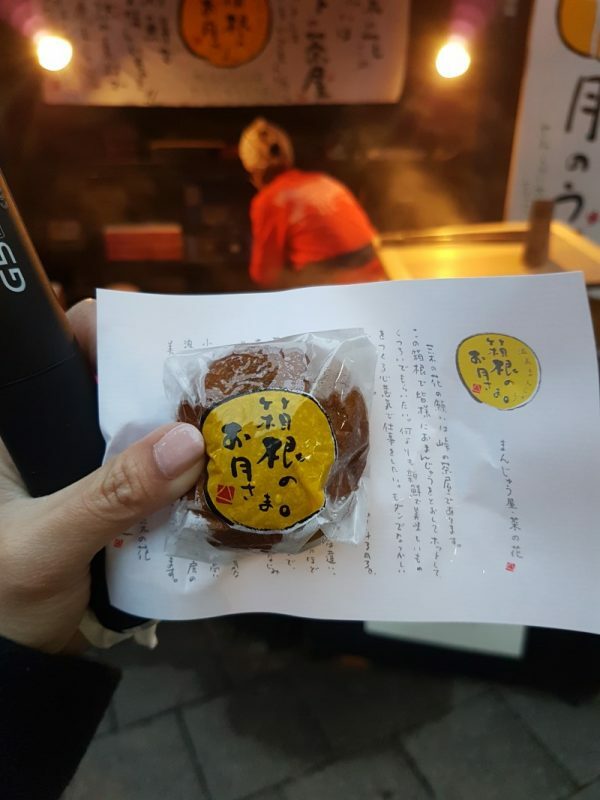 We can’t say no to this Japanese lady who was steaming these azuki-filled Manjuya Nanohana onsen manju just in front of the station elevator. 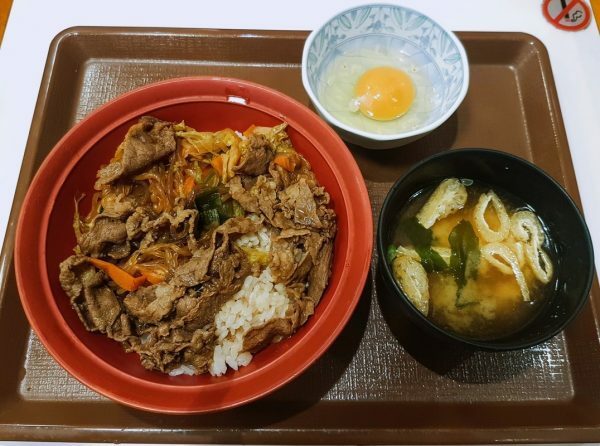 At Shinjuku, we had dinner at one of the largest gyudon chain, Sukiya (すき家). 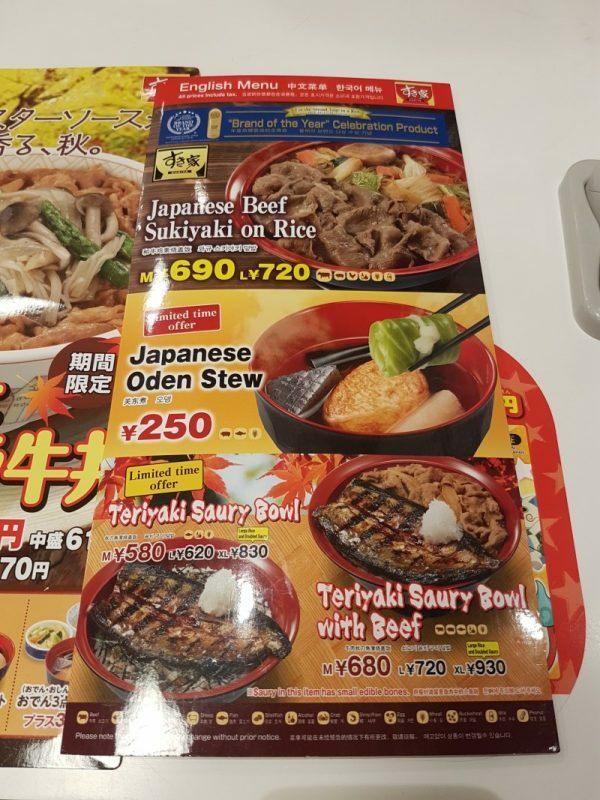 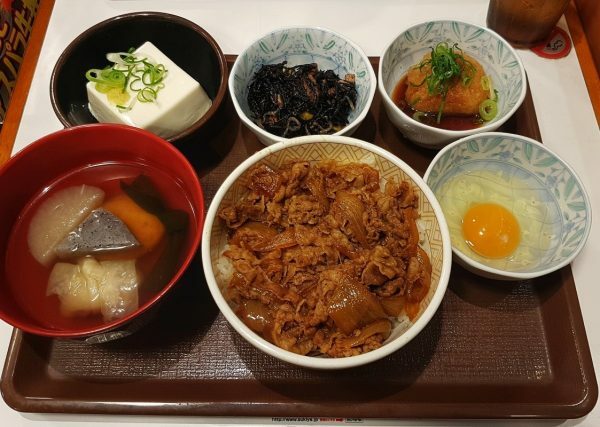 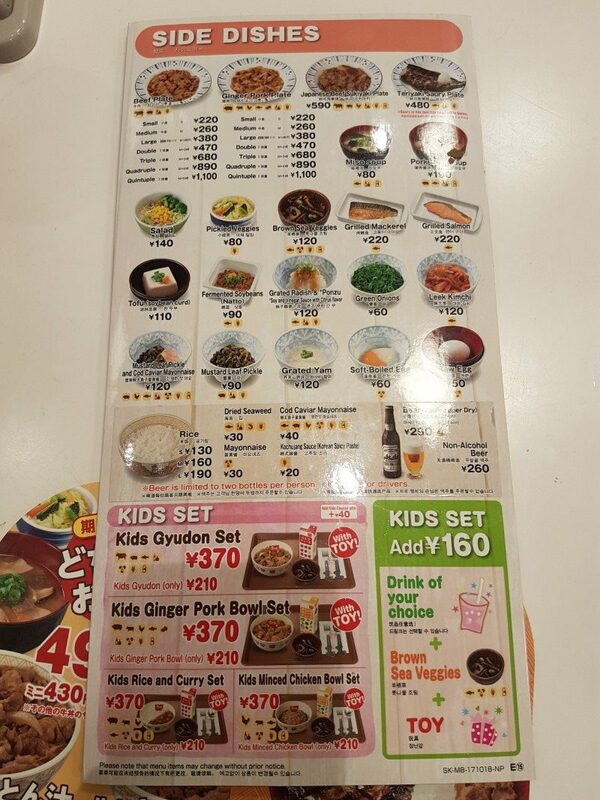 I am super impressed with Sukiya with the delicious and wide range of menu that they offer at such cheap price. 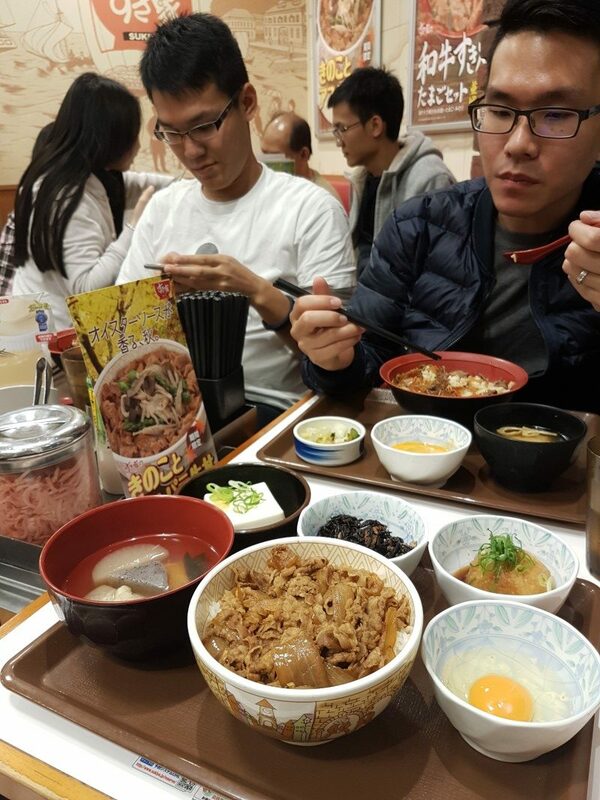 Definitely will go back to revisit!